I’m on the plane heading for Iceland now, it is minus 65.5 out side the plane and we are at 38K feet. We talked about this trip for years, planned for it, saved for it but at the end I was not at all sure it would happen. Not for any specific reason but so many things can happen and leaving for three weeks is not something we are accustomed to doing. I planted my seeds earlier this year to have them ready to go into the ground before we left and we worked hard squaring the gardens and orchards away. There was no way we could prepare the dogs for our absence but they were well cared for. There was no reason to stay so we came away. I can truly say that this was the trip of a lifetime and I am glad we have made it. 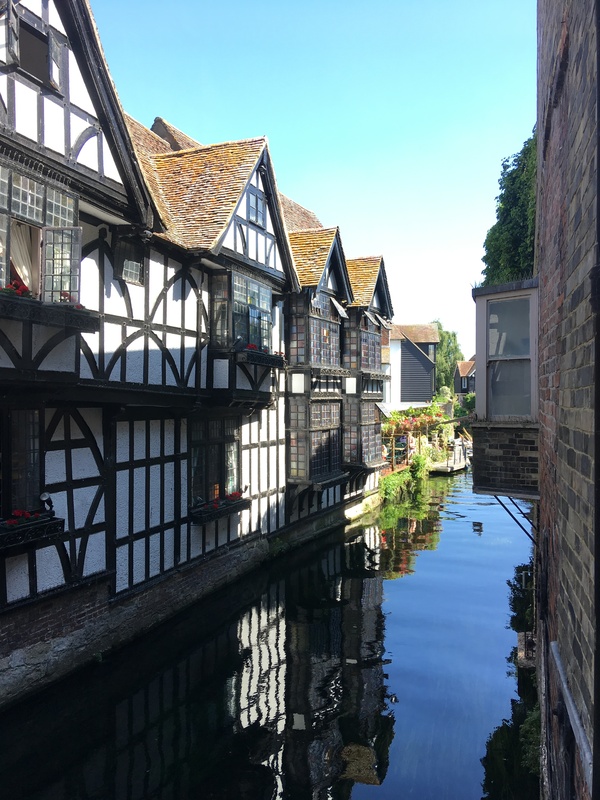 It was the only trip I have ever really wanted to make, to just drive around England and look at it and that is exactly what we did. This journey was wonderfully full of beauty and history. 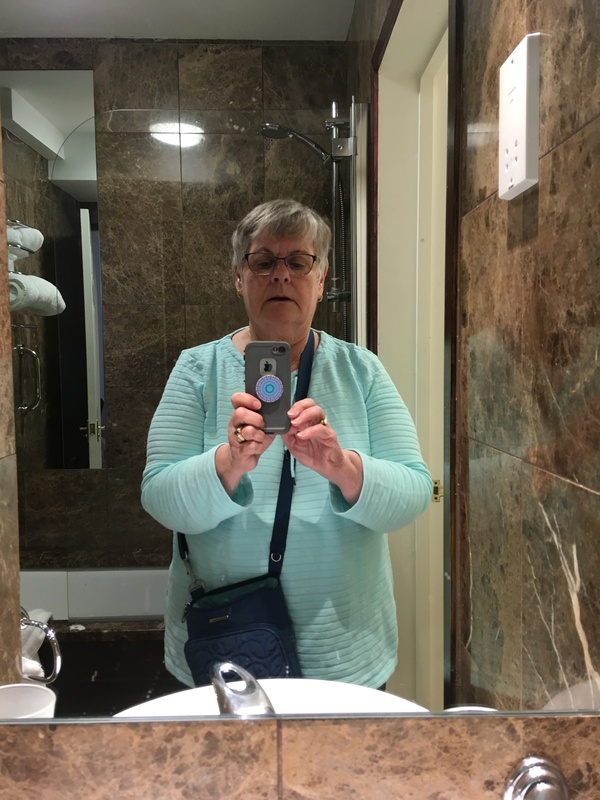 The countryside in the Cotswolds, Snowdonia National Park, the Lake District…all of Cumbria and Hadrian’s Wall and Northumbria, Yorkshire, Kent, we circumnavigated England…not as impressive as Magellan but not too shabby. It is hard to describe how I felt in some of those places. Stonehenge is just an impressive pile of stones. 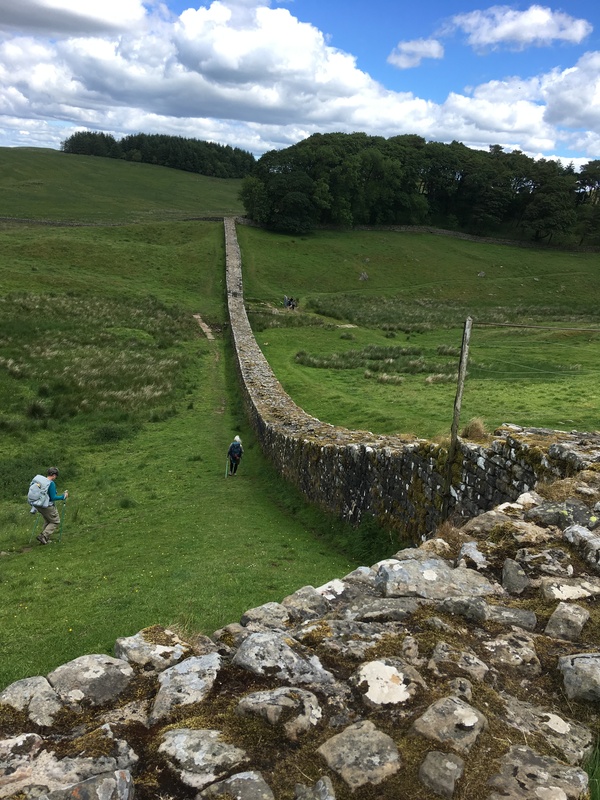 Hadrian’s Wall is, well, just another stone wall…we sure have a lot of those back home. And York Minster? Just another big church. But no. All my life I have read about Stonehenge and Hadrian’s wall and I have to say, If I could only go two places in England those would be my choices. 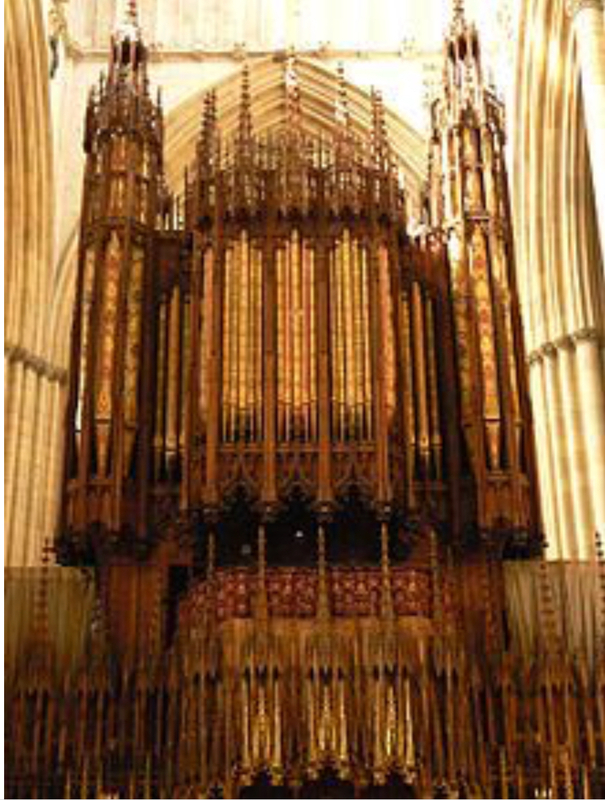 York Minster if given a third. These places made my heart and mind soar. I just cannot use enough superlatives so please consider that I have made a fool of myself gushing about everything. Eric’s driving also qualifies as superlative. He drove every mile without a murmur of complaint, took me everywhere I wanted to go and left when I’d had enough. I should also mention that he planned our route, got our lodgings and car, our train tickets, and threaded our way through train stations. He made this fiftieth anniversary journey work and work well. As far as being married fifty years goes….each day is lived for itself, each month, each year. It doesn’t seem like all these years have passed, just these days and months. Sometimes I look back, far back and remember my youth, grandparents, parents, our young children, all that history that is important only to me, only to us. What is truly shocking is how brief it all seems and how infinitely precious. But my home is precious as are my dear family, my friends, the church and all the connections, the tie lines radiating out from my heart. I am content, more than content with my lot in life. I am happy: not happy on my own but because of all of you. Sometimes writing this blog kept me up into the night but I have enjoyed it. Theadora once said that writing her blog from her year in Manchester took some sticking to it and I agree and it’s only three weeks. A year from now Eric and I are going to read all this over and set it in our minds again: our 50th anniversary pilgrimage. 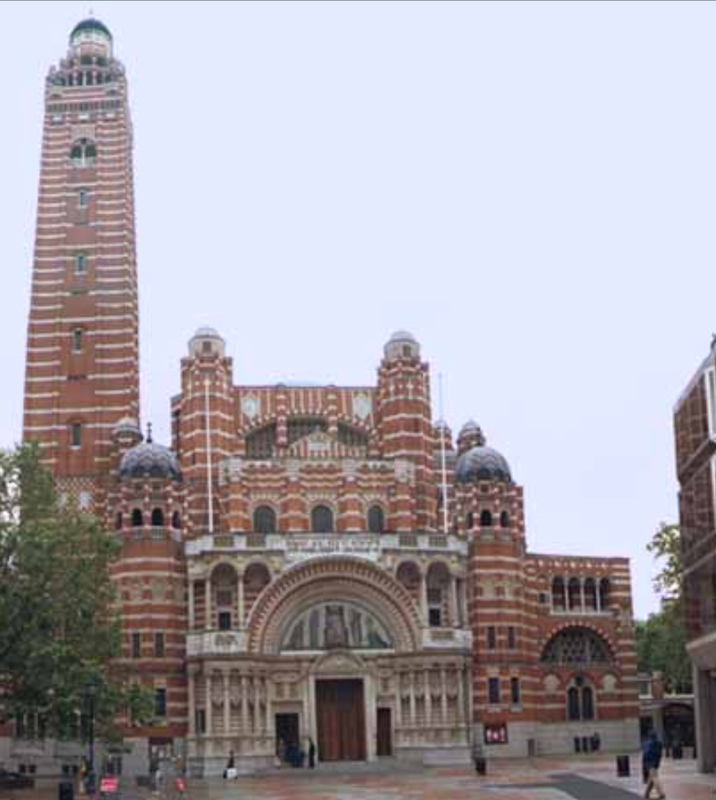 When we ventured out of our hotel the next morning we found we were within walking distance to Westminster Cathedral and Westminster Abby: the Cathedral is Roman Catholic and the Abby is Church of England. We visited the Cathedral first and noticed there were a few important differences from the C of E cathedrals we have been visiting. 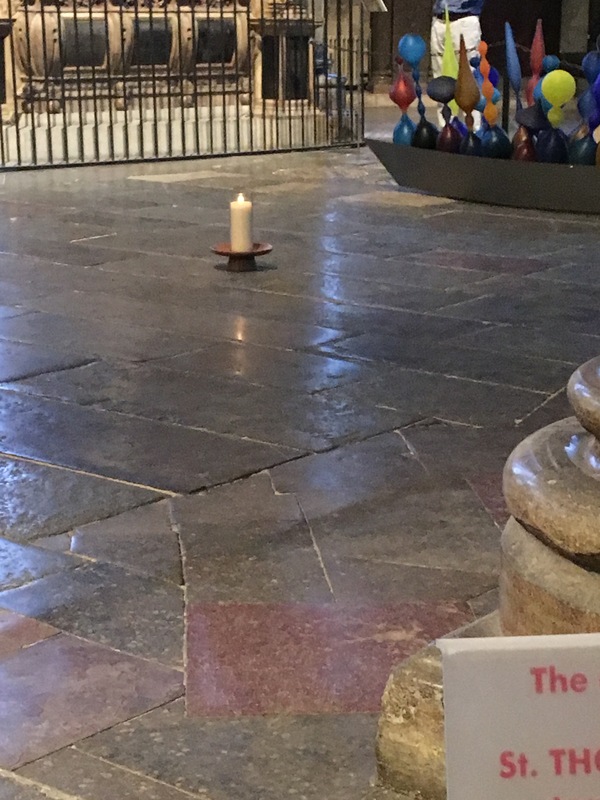 There was no charge at the door (and we did not have to pay to go to Durham Cathedral either) (a notable exception ) and prayer services and masses are said all day long. We came in at the tail end of the noon mass and just sat down. 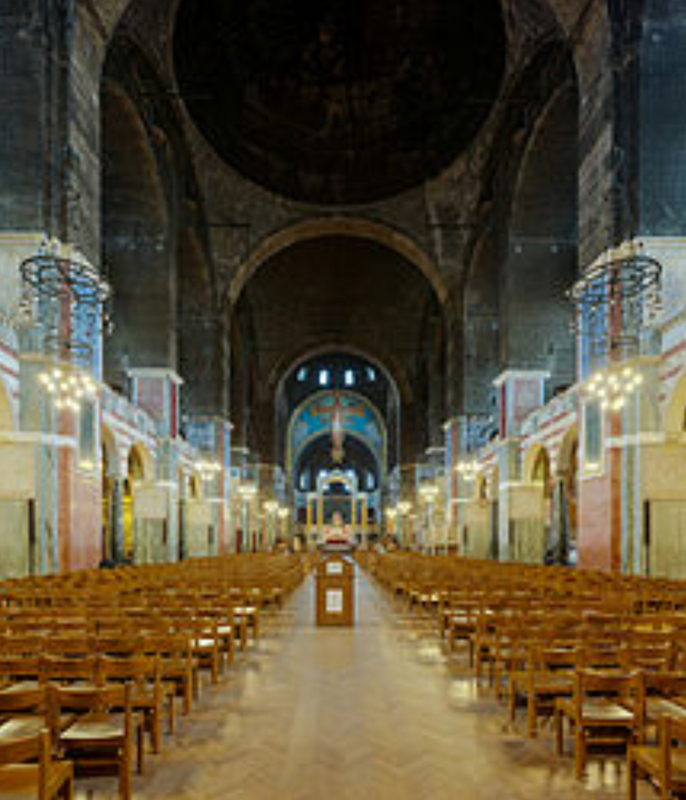 The church is made of red brick and the ceiling is plain, smoke blackened brick with no ornamentation at all and we were told that it is on purpose to make the ceiling look as if it is receding into the heavens. On the other hand, the church has side chapels down the sides of the nave and these are gorgeous. 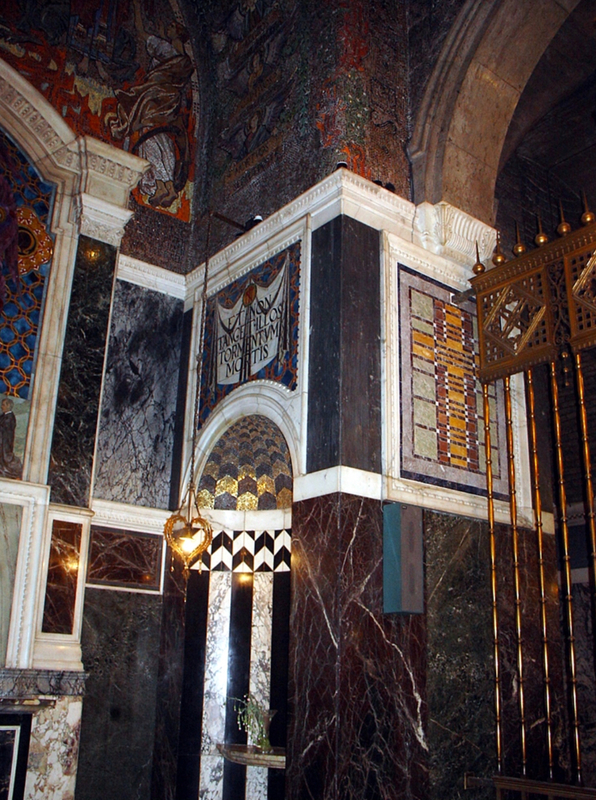 Around 150 different types of marble were used in the interior covering the walls, the floor and all of the chapels. 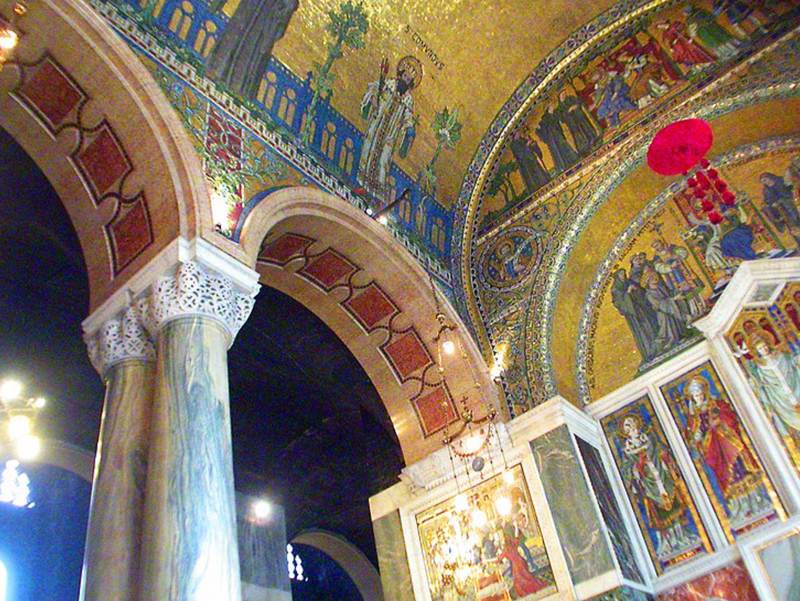 The walls are magnificent but it is the mosaics that take one’s breath away. At first we thought we were looking at paintings but looking closer the artistry of what we were seeing became apparent. The tesserae were very small and many of them were made of golden glass, I don’t know how they did that, and the ceilings were like looking into a bit of Heaven. If I can pull some pictures off the internet I’ll put them in but there was absolutely no photography allowed in the church. I did find some photos. They take their church mission seriously. This is a very new Cathedral since it was started in 1897. It is very close to the Abby so I am guessing it was a late Victorian thumb on the nose to the Church of England. You can see the marble in these pictures and the purposely gloomy interior. Westminster Abby was close by so we ambled over there…in the hottest day so far…and debated whether or not to pay the piper to the tune of 17 pounds each to go in. But, we ‘shall not pass this way again’ so we went in and, and…. What can I say? Anyone can look at pictures of the Abby on line…again no photographs…but to actually be there? Not so easy. Sure the monarchs are crowned there, royal weddings take place there…but that is not what makes it totally freaked out amazing. 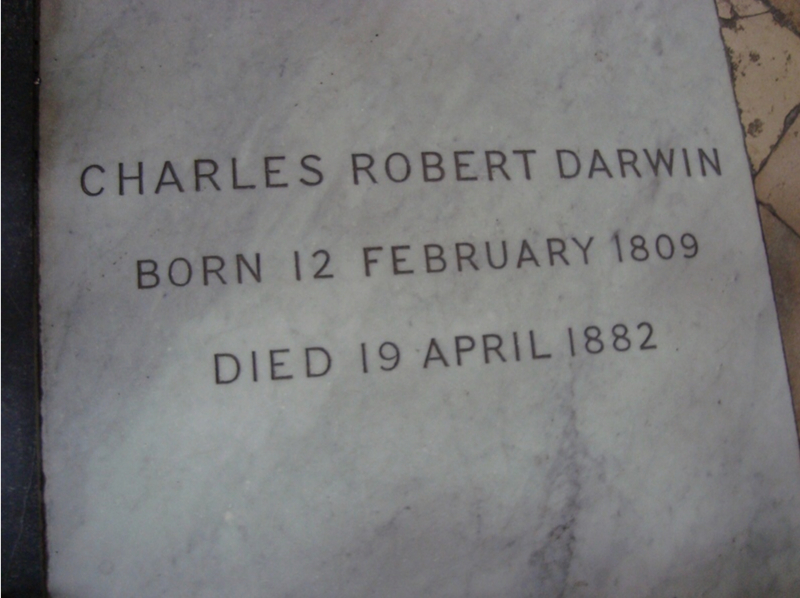 Charles Darwin is buried there! 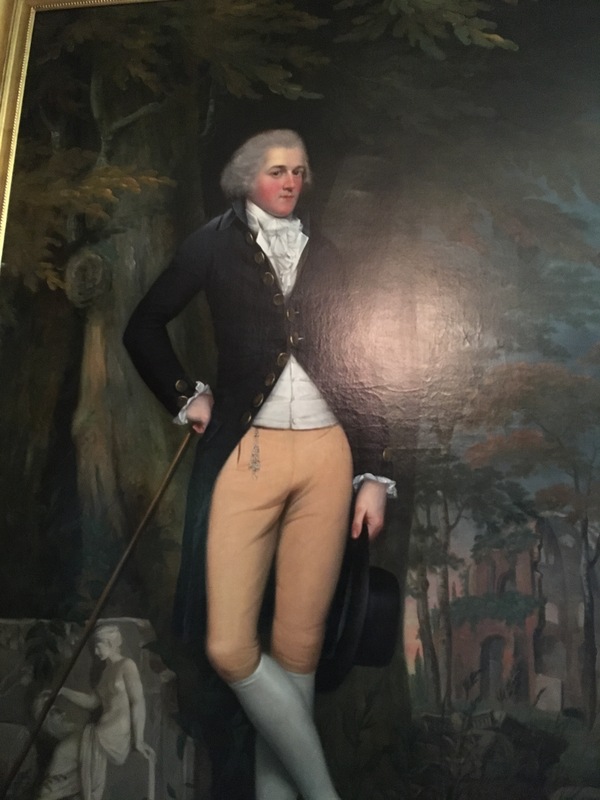 I walked on his grave marker…a lot. 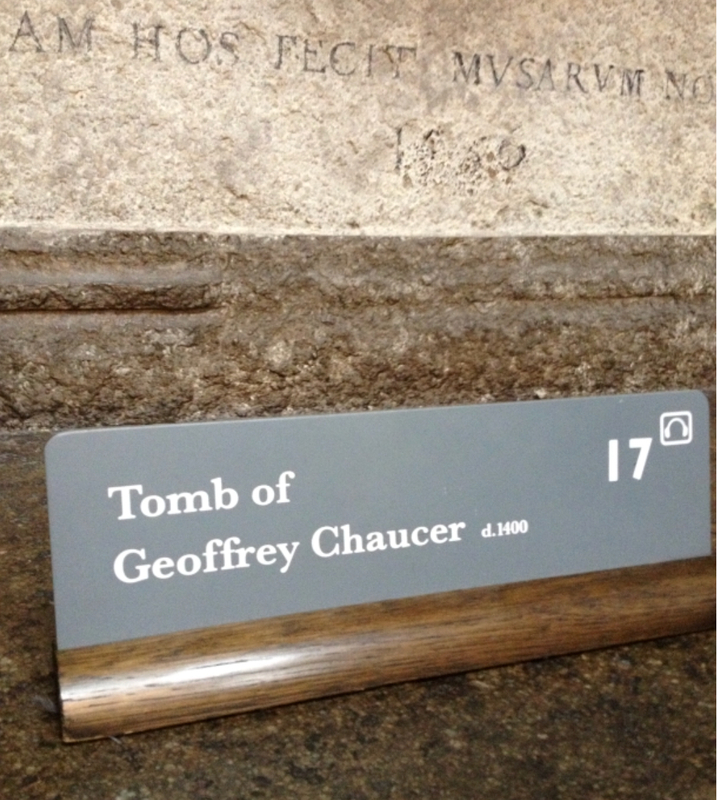 Geoffrey Chaucer is buried there, and Lewis Carroll, and C.S. Lewis, and Turner and Dickens. Livingstone was carried all the way from Africa and they dug a hole in the Abby floor and stuck him in there, too. 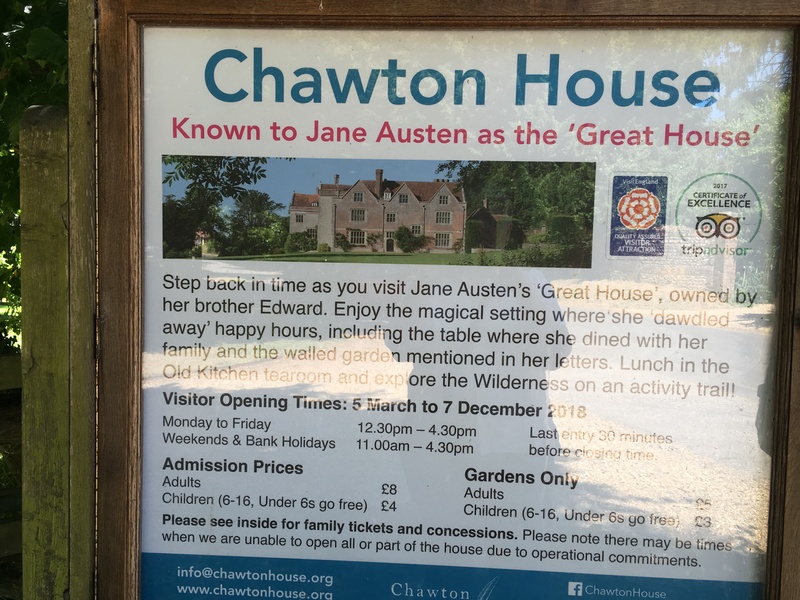 And Jane Austen, and the Brontë sisters, and Mary Anne Evens and so many more. And plaques honoring people who were buried elsewhere but contributed to the thoughts…the great thoughts of generations to come and changed the way we see the world and and its people. 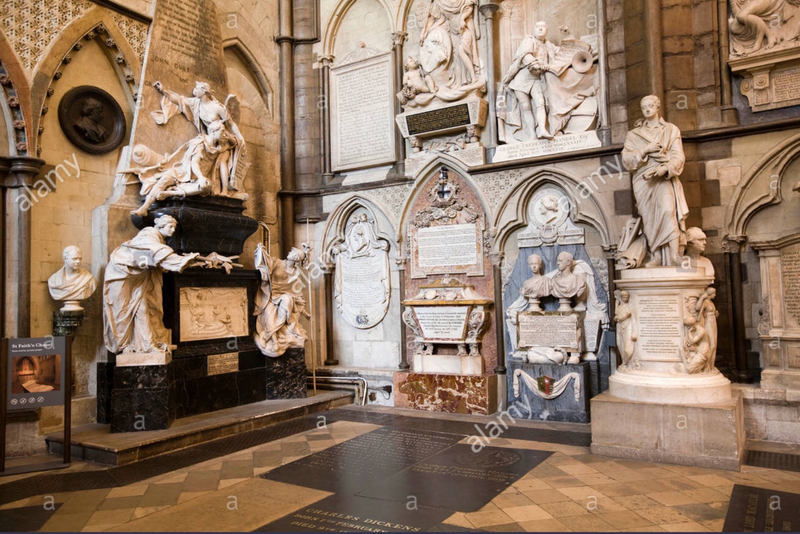 For me, Westminster Abby is a shrine to all these great minds, people who were swept up in time because of native ability, the right moment, and pure luck . 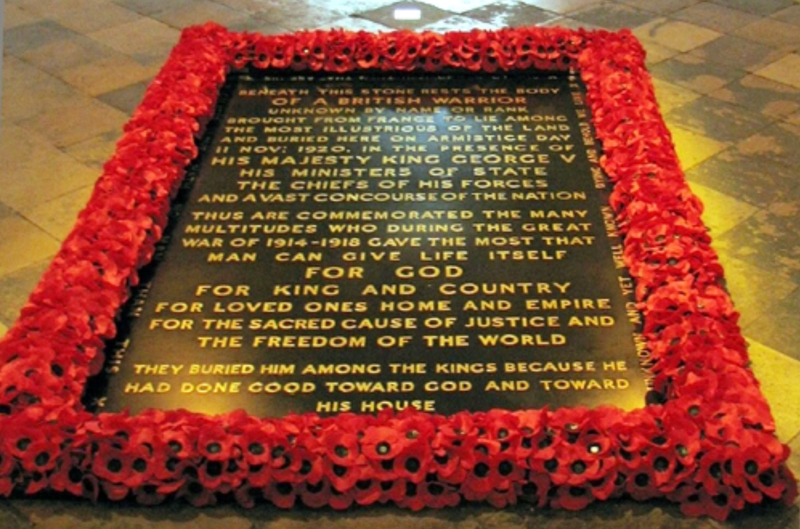 There is also a memorial to an unknown soldier from WWI. A man was brought back, unidentified, and buried there near Livingstone. (The Poets Corner to the left) Flowers are placed around the marker and it is the only marker that no one is allowed to walk across. 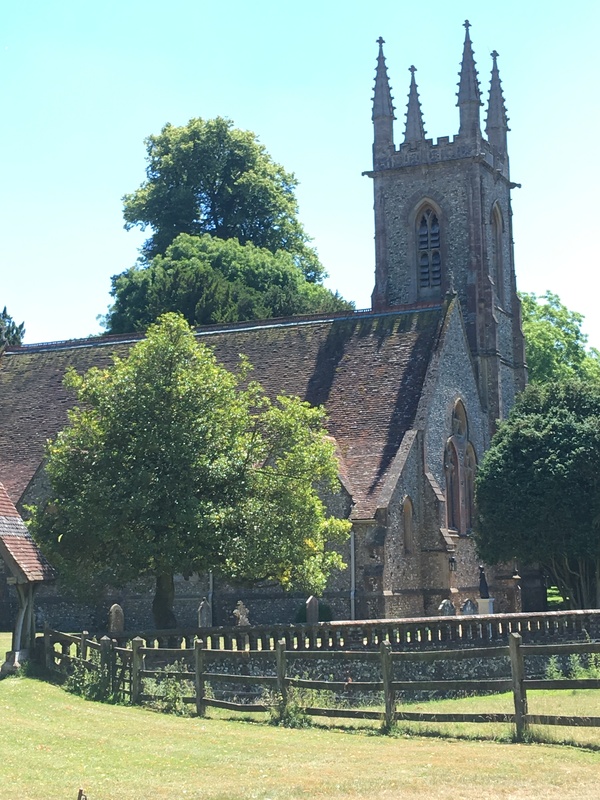 It is true that kings and queens are buried there, Elizabeth I and her sister, Mary, some Edwards, I forget the numbers, but…not Henry VIII. Remember that until his reign Westminster Abby was Roman Catholic. 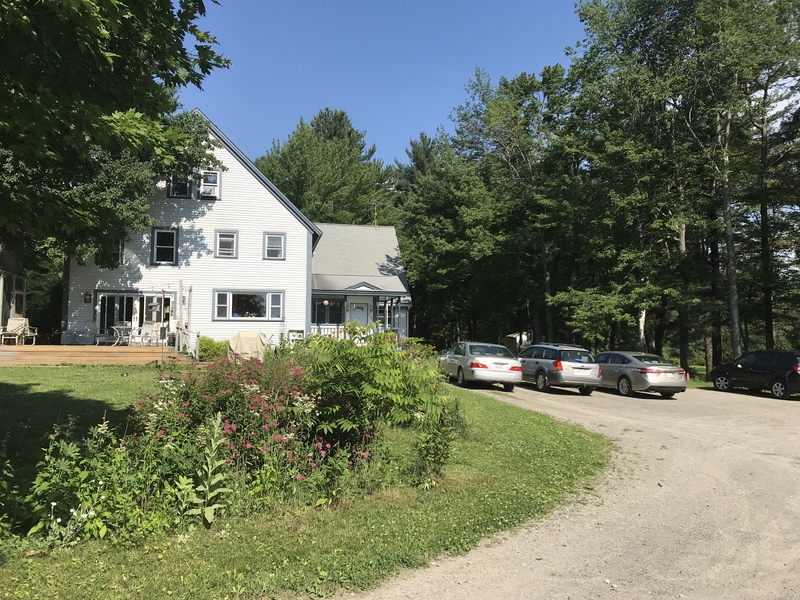 Sort of like our church in Groton which was trinitarian until the Dedham Decision and then they had to hie off down the street leaving the property and the place on the common to those upstart, heretical Unitarians. The Abby is a crypt even if they do hold services there. We could have gone to Evensong there but after York Minster there didn’t seem to be much point. After we left Westminster Abby we walked until we found an Italian restaurant No more steak and ale pie unless I make it myself. We had a beef and venison ragout with pasta…maybe the Italian version of steak and ale? We split an enormous bottle of Italian beer. Delicious. 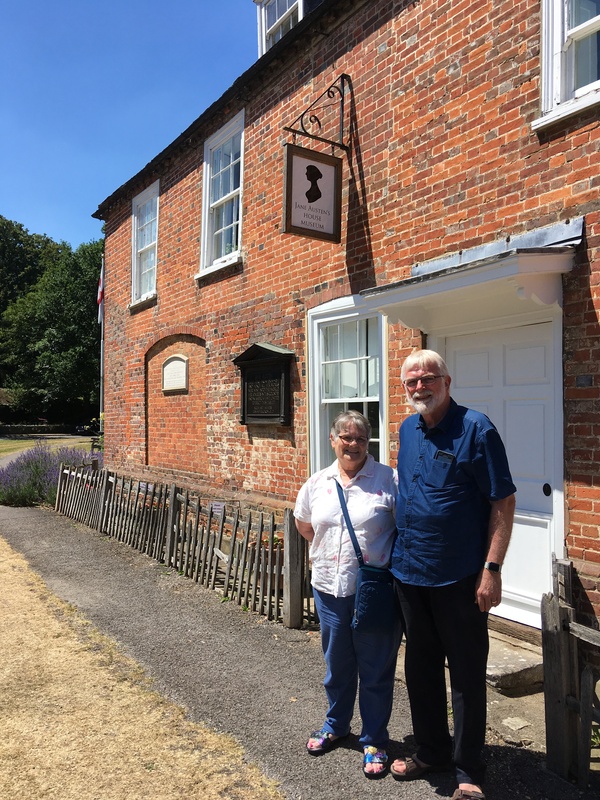 From Canterbury we drove south west to the town where Jane Austen lived and wrote her stories. The area is very beautiful and seemingly rural but actually quite densely populated. Some kind tourists from Cambridge took our photo outside Jane’s house. These pictures are of rooms inside the house and the chapel on the property. 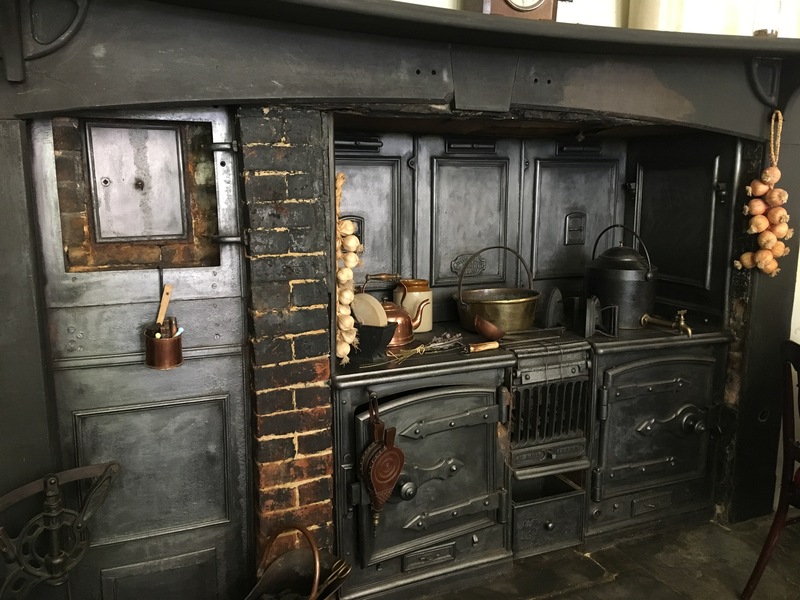 The kitchen is particularly interesting as it has not been changed much from Austen’s day. 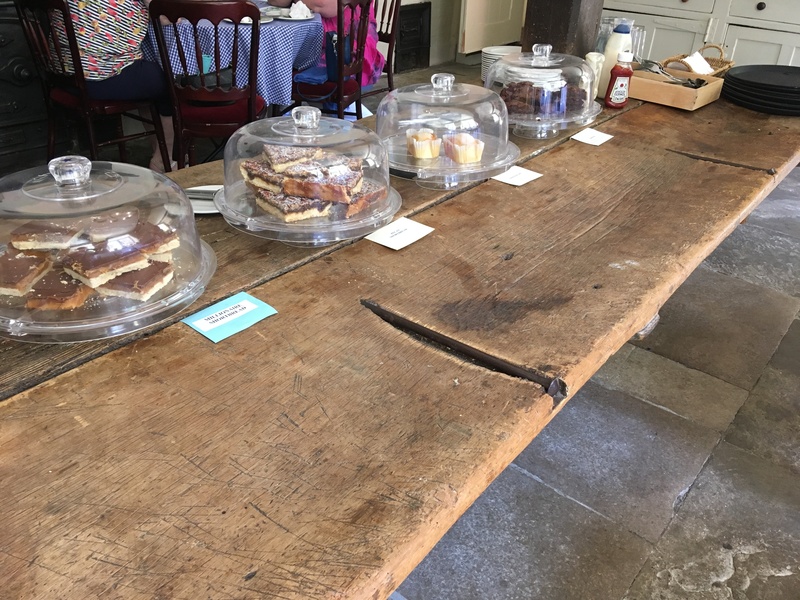 The table is so worn that the boards are concave down their length. There is anther room that has been converted into a modern kitchen and this is where the little cafe is. 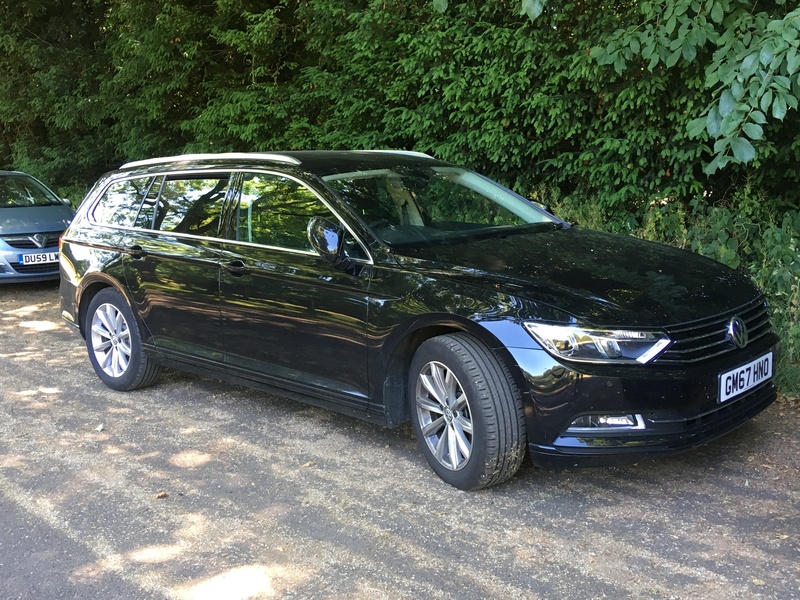 We drove on to Oxford and left the car at the Eurocar office. That car took us 1650 miles and a bit around the country for three weeks. It was quiet, efficient and it had a navigation system so good, so finely tuned that it could tell us when to turn no matter where we were. It made the trip worry free and the man at the car rental just gave it to us for free. 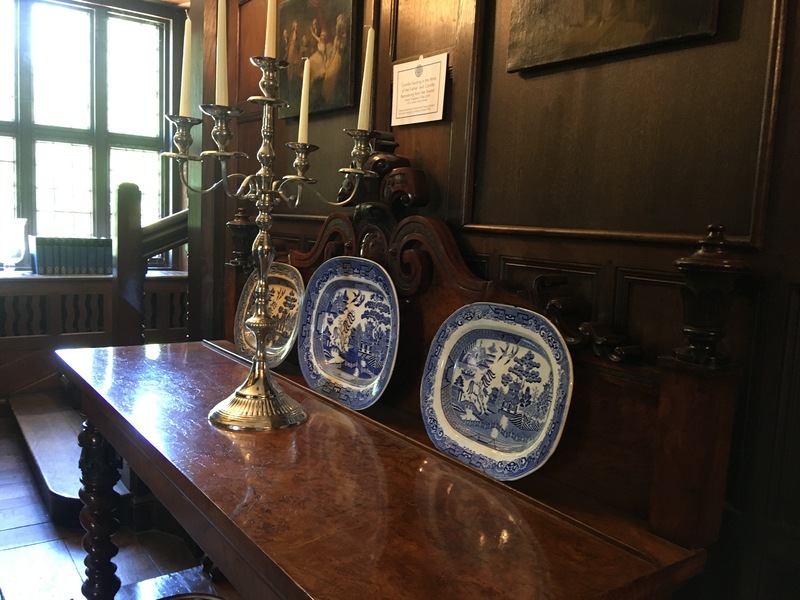 We took the train to London and a cab to our hotel, The Lord Milner, and on the way the cabbie insisted we download the cab company app so he could give us 15 pounds off our fare…that being our first trip, so we did and our fair was next to nothing. I mean really, people have been very nice to us. 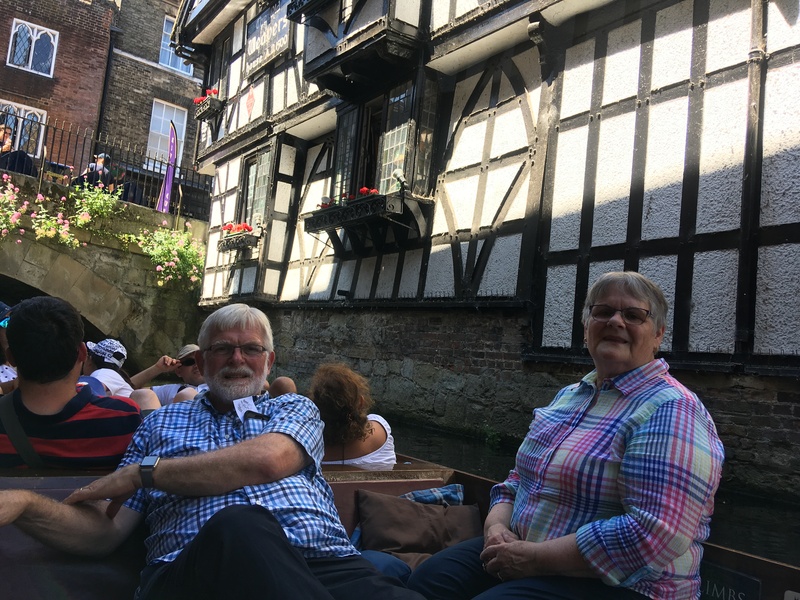 Then we had one day in London…..
Our pilgramage to Canterbury to pause and reflect where Thomas Becket was murdered began as we sat in a punt with other pilgrims and journeyed into the city. Some of the pilgrims were from Spain and one very beautiful lady was from Nepal, Kathmandu to be precise, and we, as you know, journeyed over the water from the lands to the far west. We were a motley crew in the truest sense of the phrase. 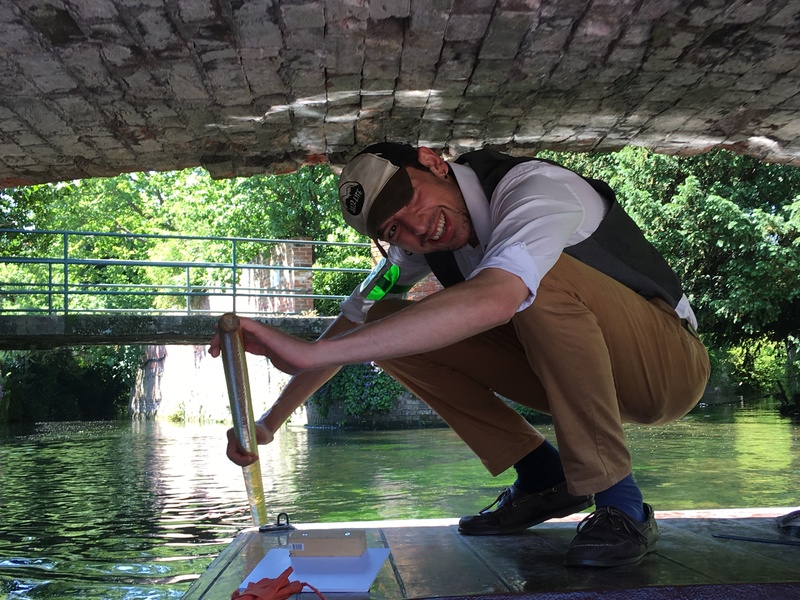 Our guide punted us along one of the canals of the Stour river. The bridges along the canal are very low and we had to keep our heads down. One of the bridges had an indigenous population of hay spiders which, we were told, we were not to disturb. Another pilgrimage led us to an ancient breed of Roman snails which were told not to put in our pockets to eat later…as if we would eat those hay 🕷 spiders! The very idea! 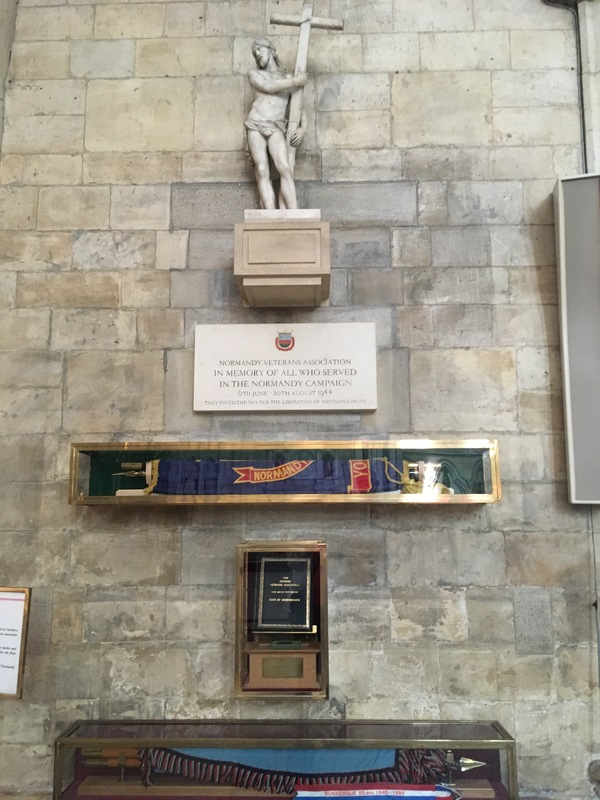 We visited a memorial to a pilgrimage that took place in 1389 or so. I don’t know why their tales are any better than ours but that’s history for you. We had to pay a penny to go in and I’ll tell you, I was saving that penny for a big mug of ale and a beef pie for my dinner. 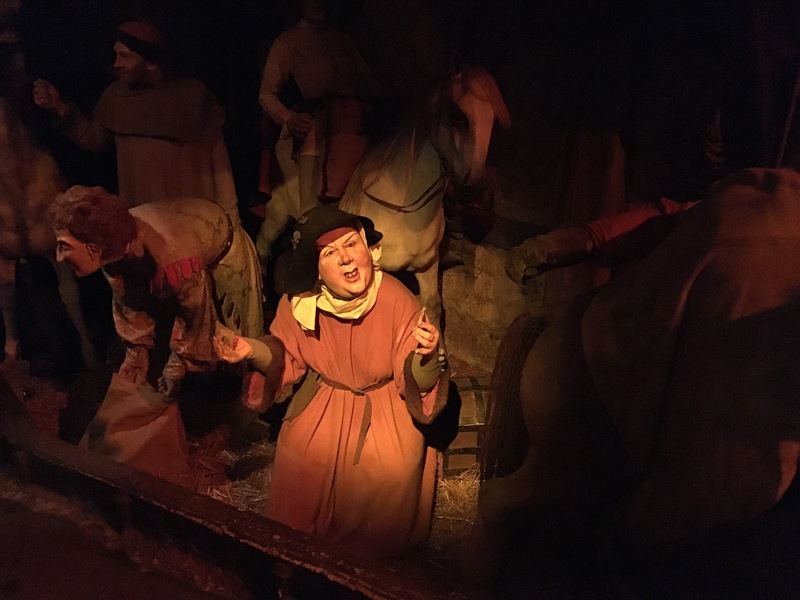 But it was worth it to see those pilgrims of yore and hear their tales…that old dame had five husbands (not all at once) and she choose the last one because she admired his thighs as he carried her forth deceased husband’s casket! Now that’s a women…keeping her priorities straight. That’s her telling her tale and below her are some of the other characters who told tales. We finally made it to Canterbury cathedral and you would be surprised at the terrible shape it is in! There were stone masons and painters and sculptures working all over the place. I mean, I’d say it isn’t even all that old but in truth, they have been building and rebuilding that church for a thousand years so I shouldn’t be too put out that we couldn’t see the ceiling of the nave. They put a wooden ceiling up there because thay had to take the lead roof off, melt it down, recast it and put it back up. 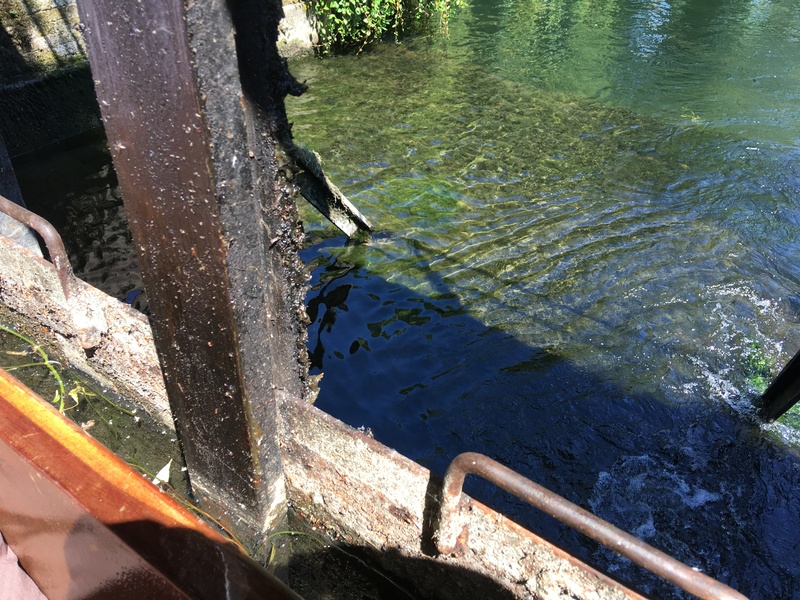 If there is a hole water will find it….I use straw and daub on my roof and it doesn’t work any where near as well as lead. They have carved new statues to replace some that are weather worn and that stained glass! It’s beautiful but it takes a lot of care. It’s a good thing that the lottery the Queen has going puts coin into it. Imagine, gambling to repair a church! 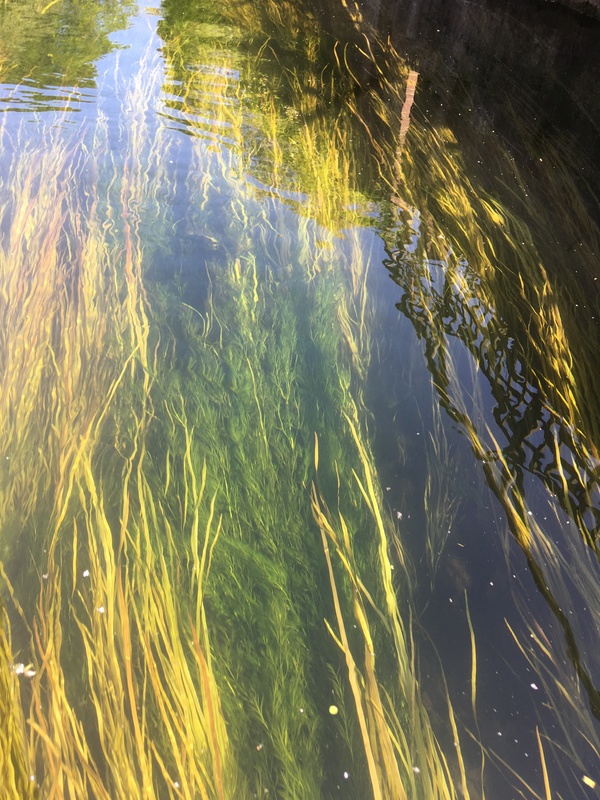 It fairly makes my head swim. 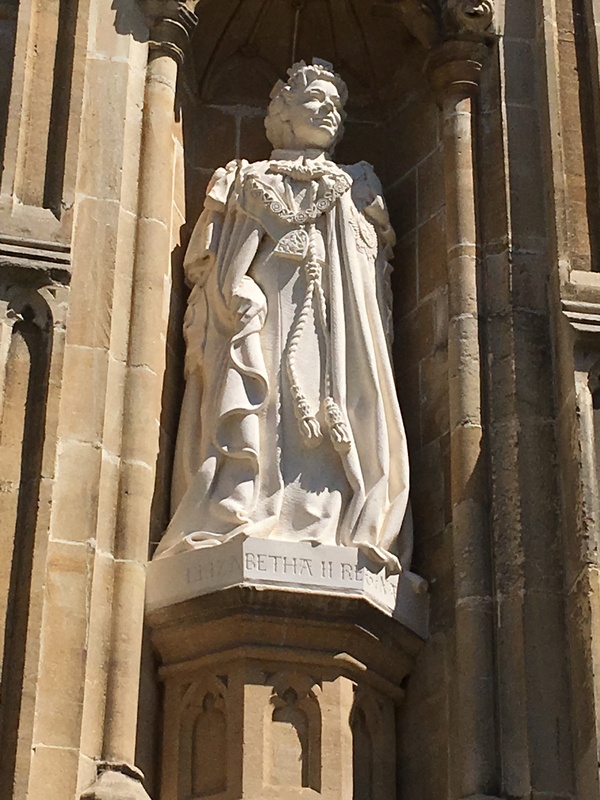 The people must be grateful because there are new statues of the Queen and her consort on the front of the cathedral. An interesting thing about this church is that is is not level. The ground rises toward the quire and there are steps leading up in several places. When we visited the crypt we were surprised to see windows it was that high. Instead of digging all that ground away they just adapted the building to fit. 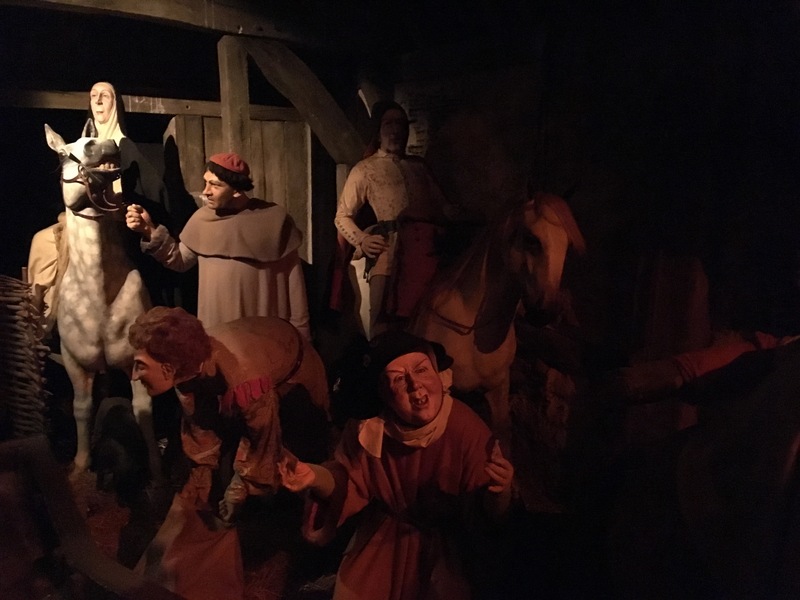 But they have to keep the place up for us pilgrims so we can visit the place Becket was offed by King Edward II. He made Becket Archbishop because he thought that he could control the church better but Becket began to become the role and they differed on who got to do what. After Becket’s death Edward want on a pilgrimage of his own and walked two miles barefoot in the snow to show his contrition. He didn’t mean to have him killed and tried to call the men back when he found out what they intended. He was very sorry because Becket was his closest friend. 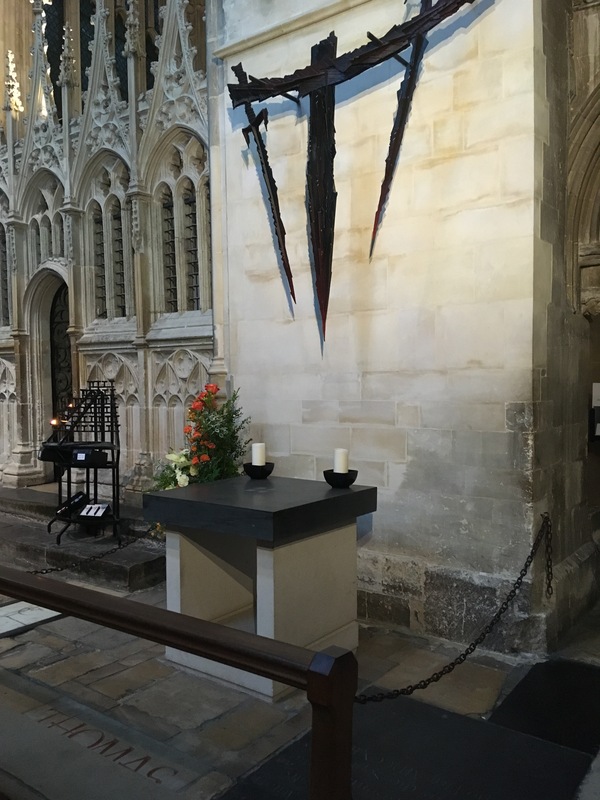 We visited the exact place Becket was murdered and I’ll tell you, it gives one the chills what with those swords on the wall behind! And that doggone Henry VIII! He destroyed Beckets tomb. But folks have the last laugh, there is a always candle burning in the exact spot of his tomb. 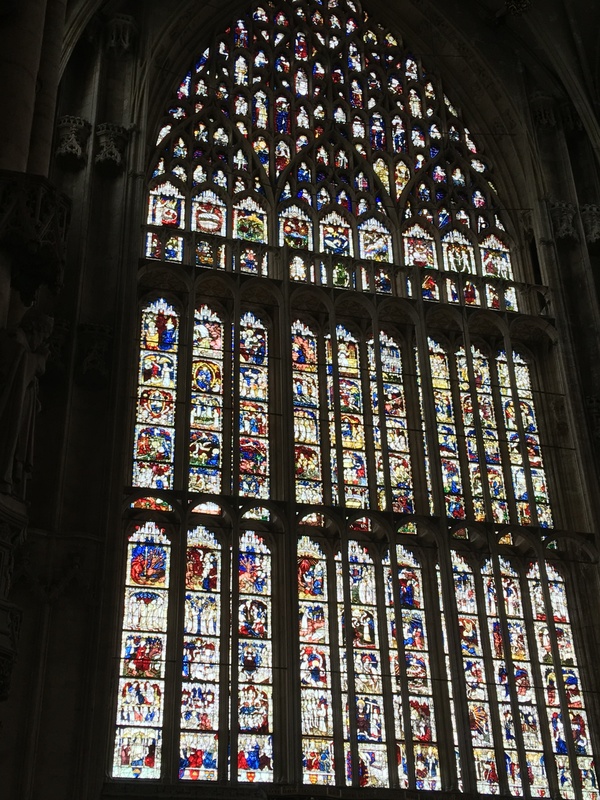 Like so many places of worship, Canterbury Cathedral was sacked by King Henry VIII. Beckets tomb was destroyed and his body was taken and no one knows where. 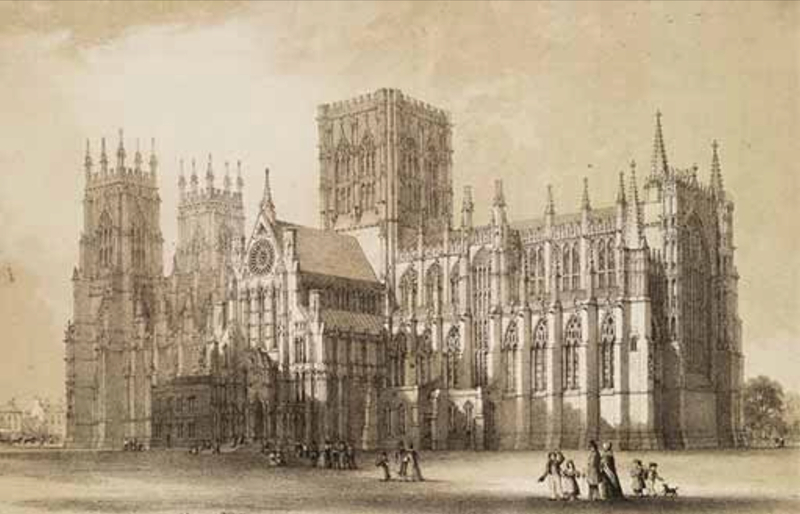 By the way, the only reason York Minster was not sacked is because King Henry died while his men were on their way to York and they turned back. I imagine that many of the men really did not want to desecrate places they had worshiped in all their lives. I hadn’t considered it before but right from the start of this journey, Eric and I have been on a pilgrimage. We both love British humor and television series. We were young watching Peter Cook, Dudley Moore, Monty Python, the James Bonds and so many more. 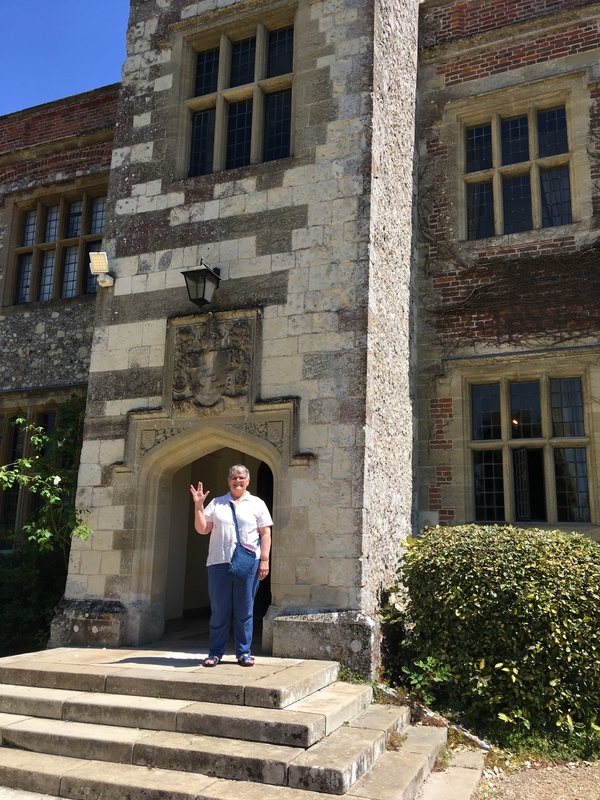 I have read Chaucer, the English poets, authors, and the rich history. 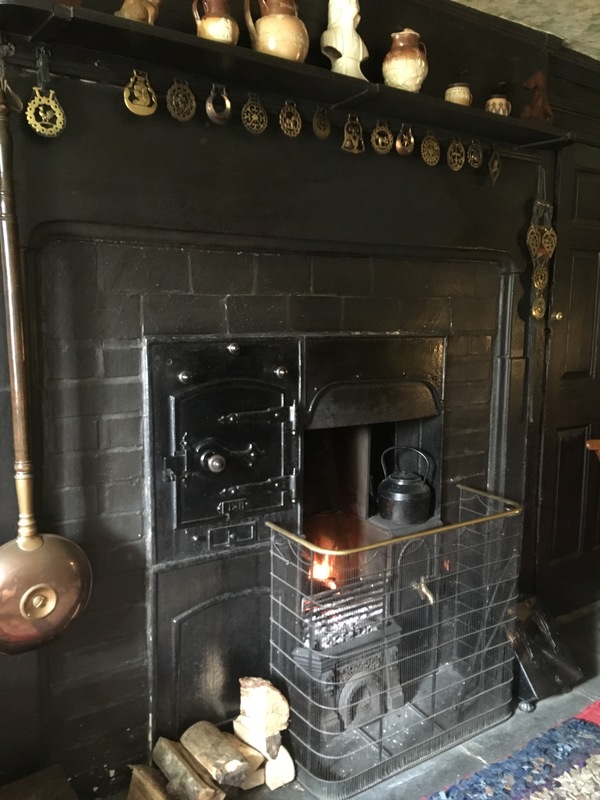 When we were in Bala, Wales our hostess, Llio, told me that my family, the Edwards’, are from that area and that there are many families with that name still there. So, yes, a pilgrimage. And more to come as tomorrow we journey to…. 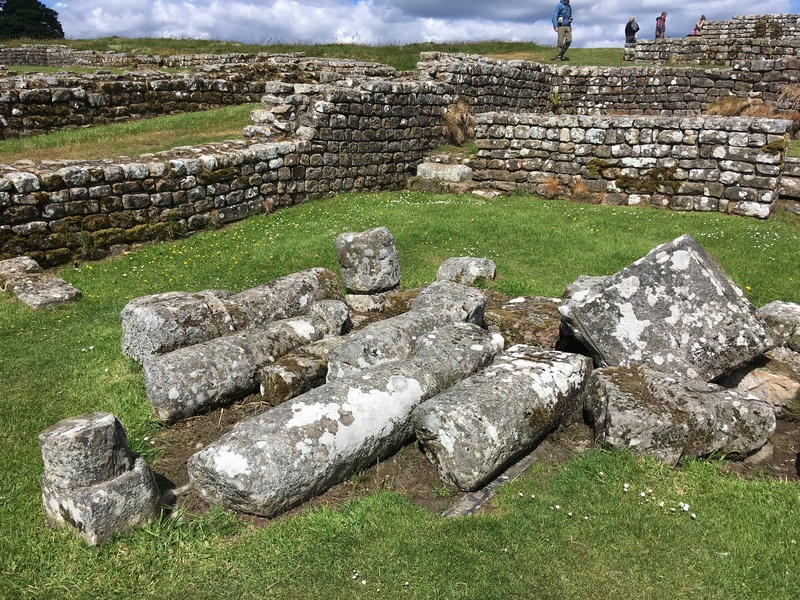 I shall begin with a disclaimer….By now you are aware that Eric and I have visited a number of places of worship starting with Stonehenge, then Salisbury, then Glouster, then the temple at Hadrian’s Wall. There was no place of worship at Carnarvon Castle or we probably would have gone there. While getting to these auspicious places we drove through the most astonishingly beautiful countryside. Yes, the USA is beautiful and I am patriotically going to say that it is more beautiful. But…the countryside around Hadrian’s Wall and that around Haltwhistle and somewhat beyond, Northumbria I think, was hills beyond hills, valleys and streams, just breathtaking vistas. 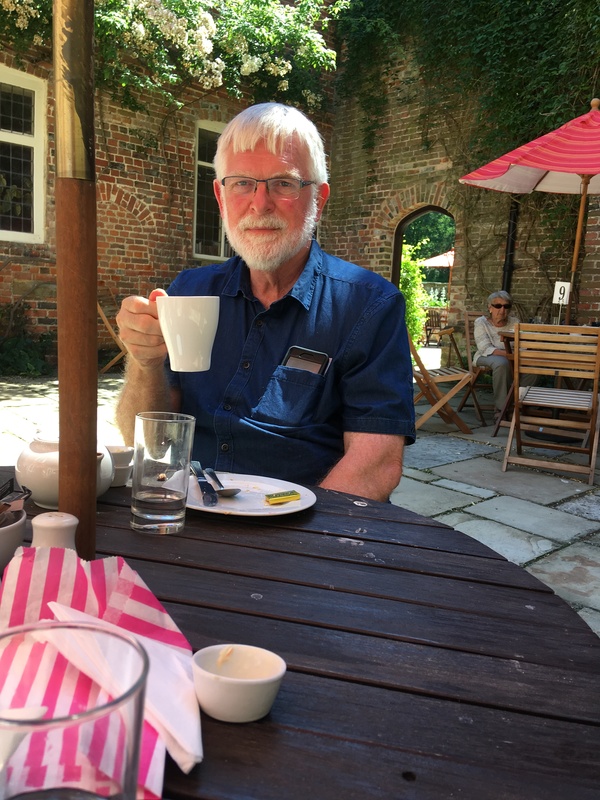 Another guest at The Gray Bull in Haltwhistle told us we must visit the cathedral at Durham witch is on the way to York….so we did, consistent with our policy to go where the locals point us. 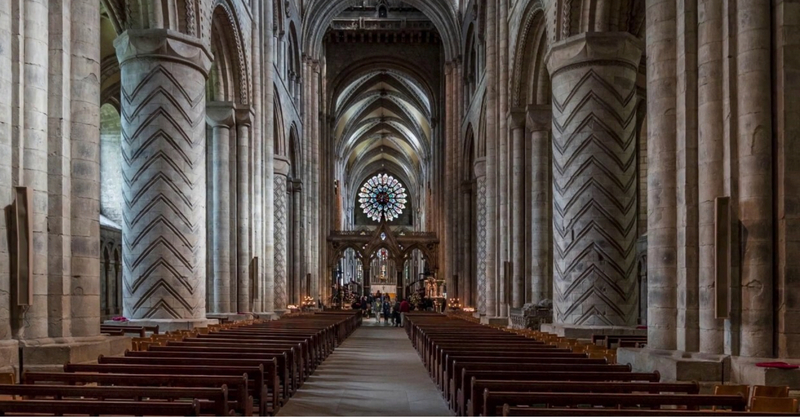 Durham Cathedral is Norman architecture, not ornate. The architect who designed it tried a new roof style that allowed this stone roof to sore many stories about the floor of the nave. Columns six meters in circumference and six meters in height supported somewhat smaller columns going up and up. The wider bases were all decorated with carving, rather simple but effective. The thing is, no photos were allowed inside the cathedral ….none at all…so I got a couple on line. You can see the carving on the posts and the pews for size comparison. No photo can do any justice to these immense churches. There was no charge to go into the building either as there mostly is in these big churches. The national lottery gives money to help these cathedrals…and smaller churches. It is the only way to preserve them as it costs so much to run them (18,000 pounds a day at Salisbury and 20,000 at York). Even British people are surprised at this cost. We do our bit here just as we do at First Parish. 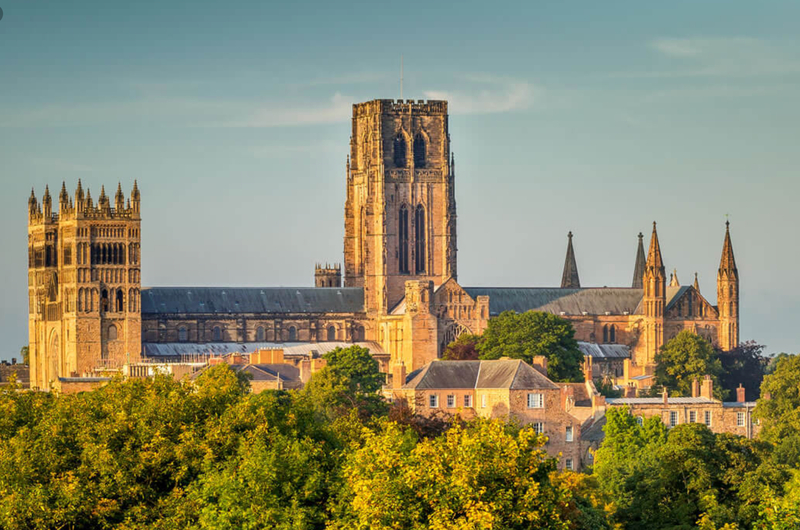 Besides being stunning, Durham holds the earthly remains of St. Cuthburt and The Venerable Bede. Maybe you have heard of them. Both were ascetics and both were heads of their church’s..more than one. 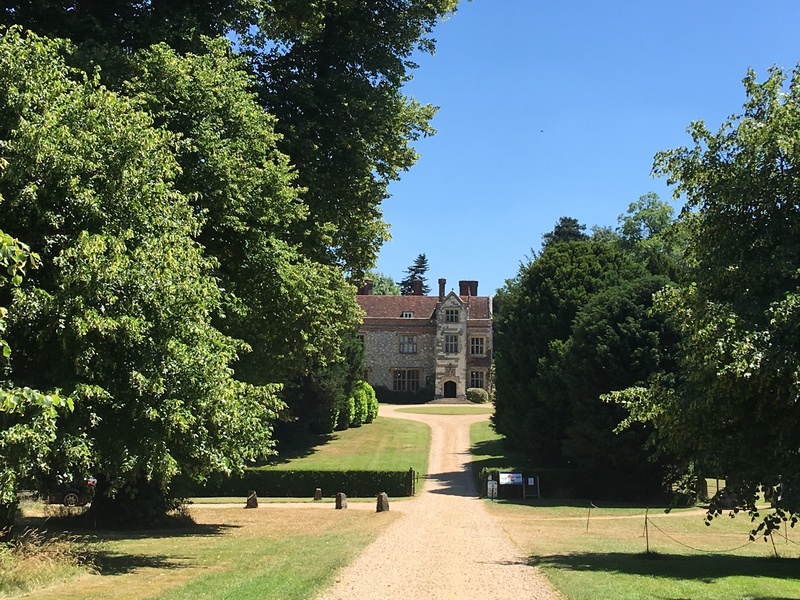 Cuthburt was a pious, gentle, generous man, a true friend of the poor and did much to spread Roman Christianity in Anglo Saxon times and also ministered to the Danes who came to English shores to pillage and stayed to worship and raise families. 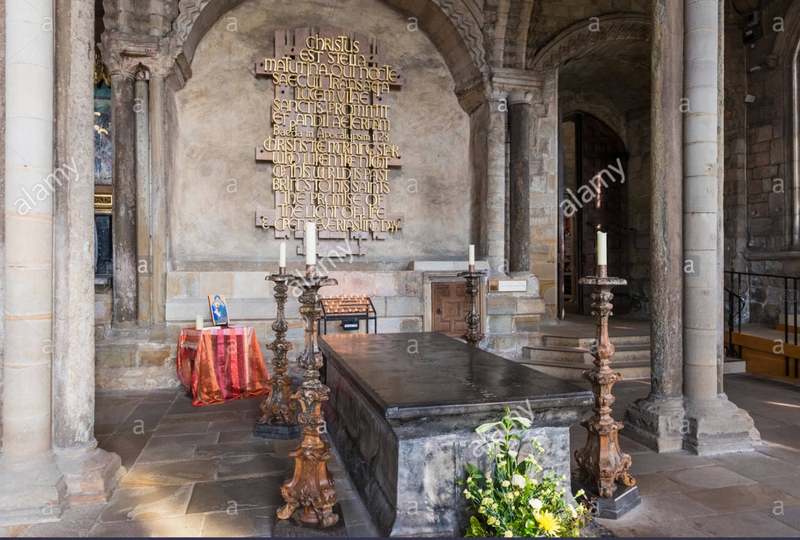 The Venerable Bede (his tomb to the left) is famous in religious and secular worlds because of his extensive writings. Two of these stand out, the famous Historia Ecciesiastica gentis Anglorum…translated as the Christian History of the English People. completed in 731 and that garnered him the title “Father of English History”. He also wrote “De Temporum Ratione”, “The Reckoning of Time”, in which book he delineated the method of determining the date of Easter (first Sunday after the first full moon after the Vernal Equinox) which was accepted at the Synod of Whitby. He also, building on an earlier genius’ work developed our dating system A.D. and B.C. (Now a bit changed but essentially the same) because before that it was a mishmash of dates according to the reigns of various kings. He also, based upon his belief that the earth was the center of the solar system, developed an entire computational apology for the phases of the moon, tides, eclipses, etc.. A bit misguided but a man of great intellect. And for the record, a man who did his best to bring harmony to the fractured times he lived in. I met this guy in seminary so I was amazed and filled with wonder to be standing before his grave. 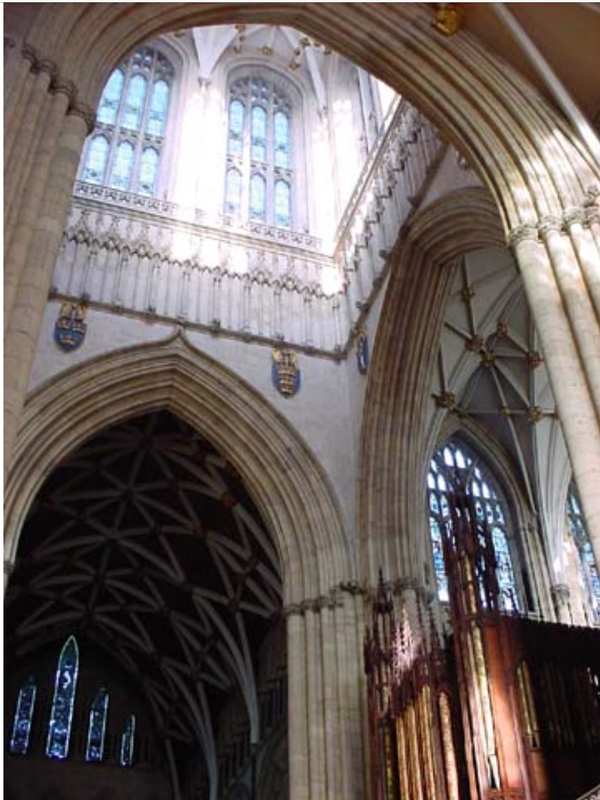 Then on to York (which I am always trying to spell, “yolk”) which has the magnificent York Minster. 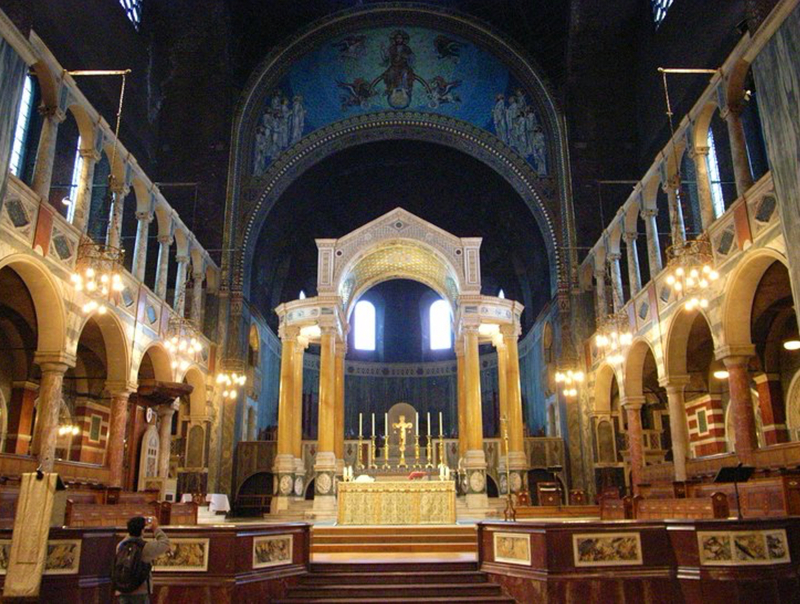 Called that because originally it had no cathedra, Bishop’s chair, and therefore was not a ‘cathedral’. 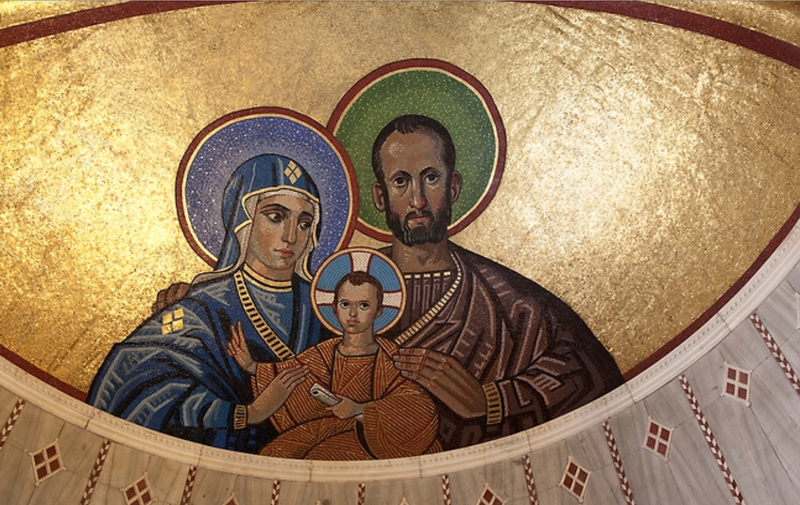 The official name is The Cathedral of St. Peter but people still use the older name. This cathedral, like all the others, was a center of learning and employment. 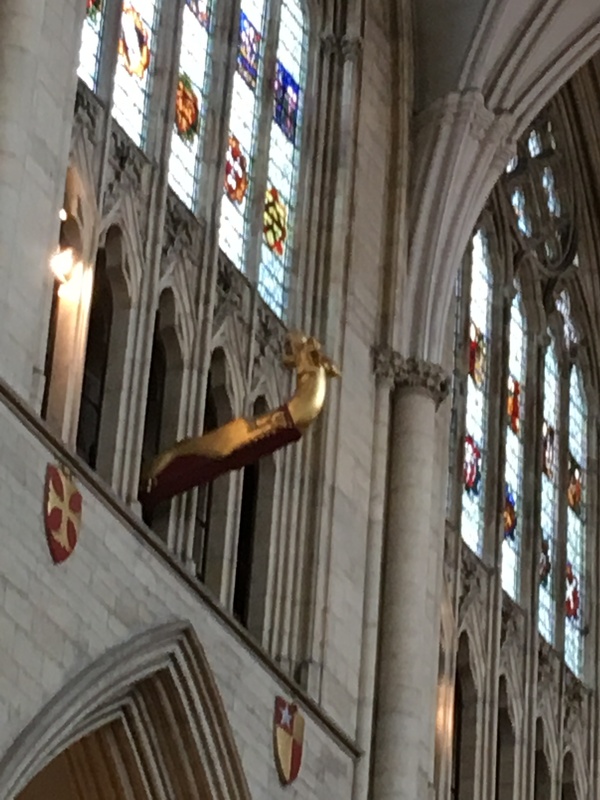 There is a dragon in York Minster that is actually a balance beam lift. 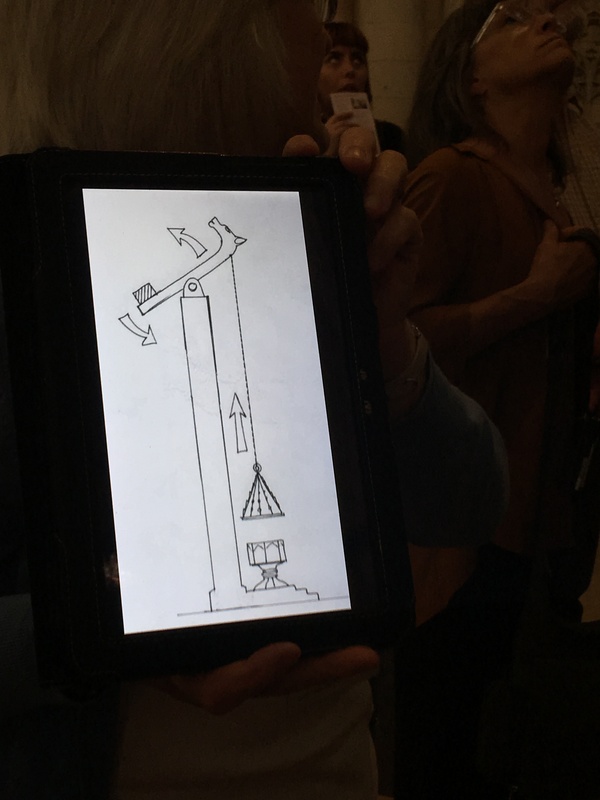 The diagram of how it works is on the left and the dragon on the right and they probably used it to lift the lid off the baptismal font…they had some really large ones. I love this cathedral. I wanted to see Salisbury Cathedral but it didn’t capture my heart and York Minster did. (The refurbished window in the Mary Chapel). We have been at Evensong in Salisbury and in Glouster and now in York Minster. If I lived in York I would be there then as often as possible. The service was just as lovely as the others, (the choir master in Glouster was better) but the organist! He did not stint with stops. The postlude was the Allegro from the Sixth Symphony by Widor. You can google that but your speakers won’t do it justice. It shook the cathedral! I could almost feel it in my bones and I had the fantasy that the sound waves were penetrating my body and reverberating there. The organ loft… Since I was there last, in 2007, they refurbished the window in the Mary Chapel. 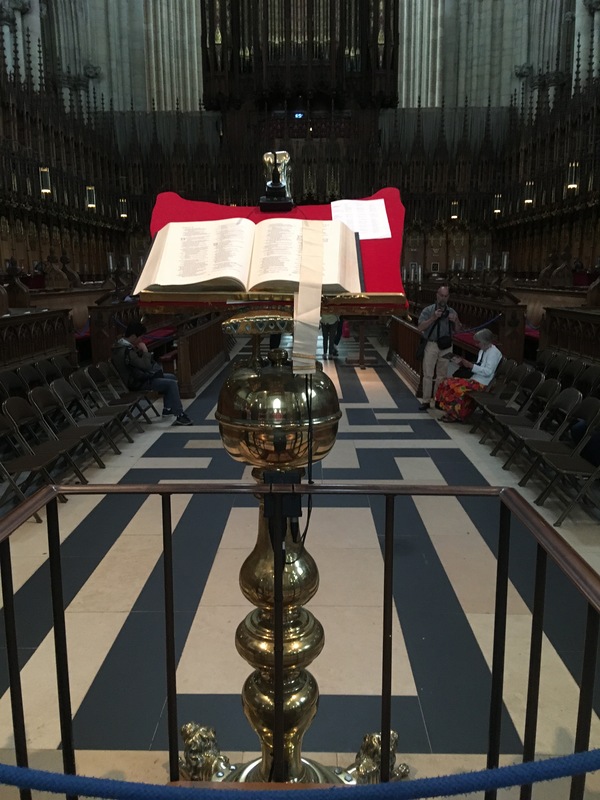 (The quire is behind the lecturn…we sat on the left). (Wall memorial to the men of Patton’s army with whom Eric’s dad served as Chaplin in WWII). All the cathedrals are putting thermal glass on the outside of their windows to help preserve them. 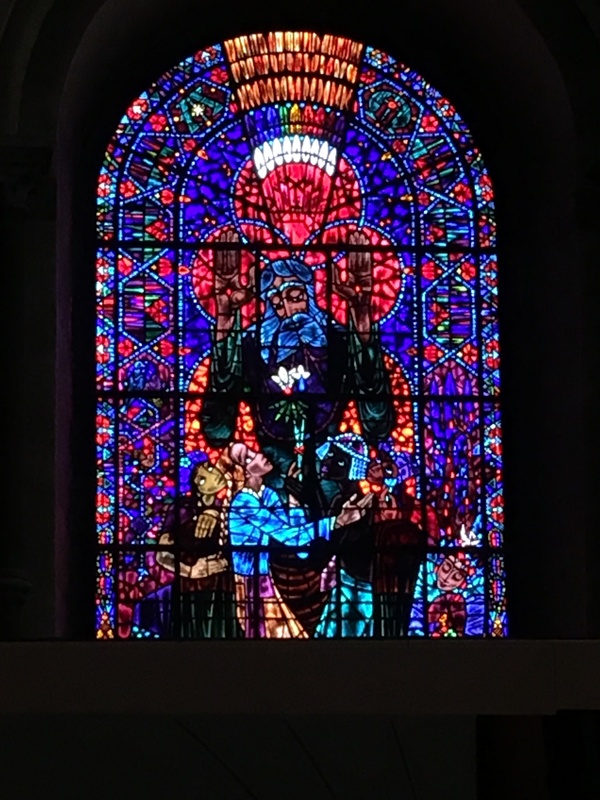 Some of those stained glass windows are around a thousand years old and rebuilding them and saving them is, besides expensive, difficult and time consuming and so worth it. Durham is a World Heritage site just as Stonehenge is. 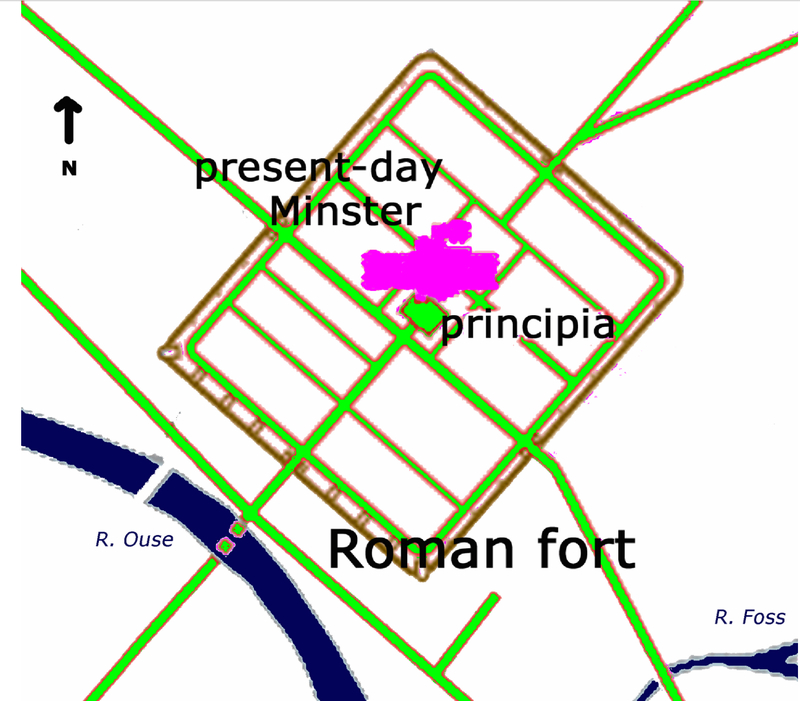 There are the ruins of a Roman garrison beneath York Minster and the surrounding old town. This garrison held an entire legion of 5000 men, five times the size of the fort at Hadrian’s Wall. 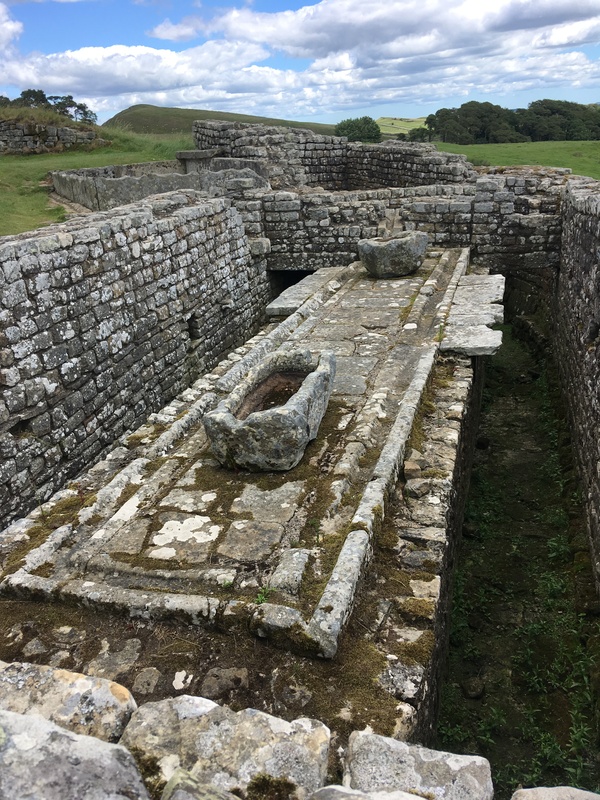 This was a major Roman center from which they deployed men to various areas to ‘keep the peace’, which, until they were recalled to Rome, they did admirably. These remains were found when, back in the ‘50s, they excavated to find out why the central tower was sagging. 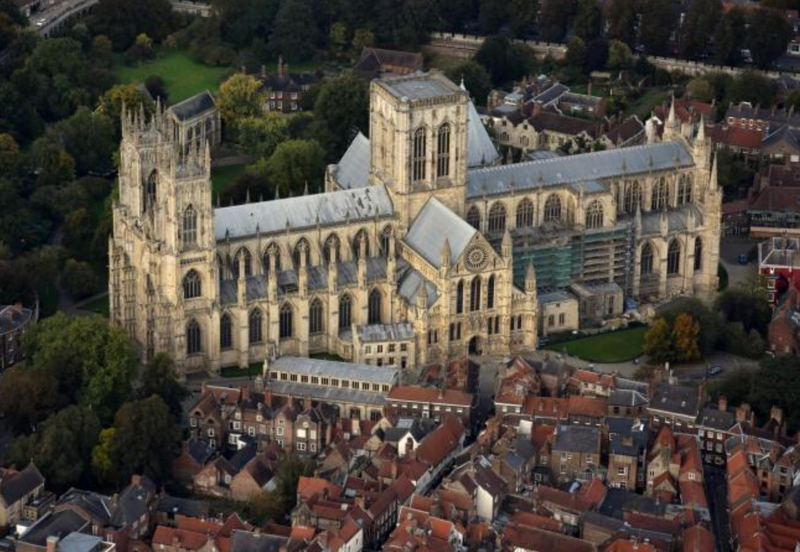 It was built on the remains of previous foundations which were not adequate to hold up any part of York Minster. 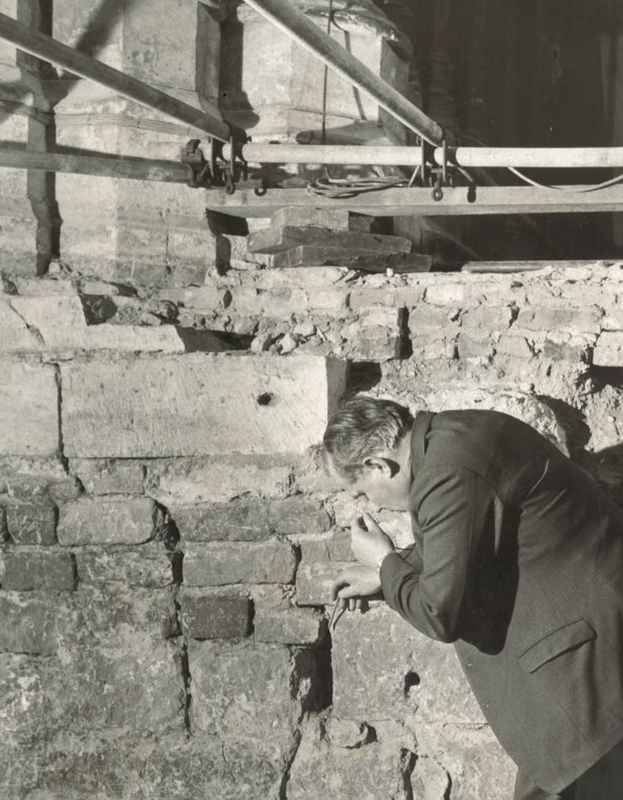 (Here is an archeologist in the ‘50s finding the rubble holding up the tower and a picture of what they were saving). Under that they found the garrison, which in its hay day was many times bigger than the cathedral enclosure. 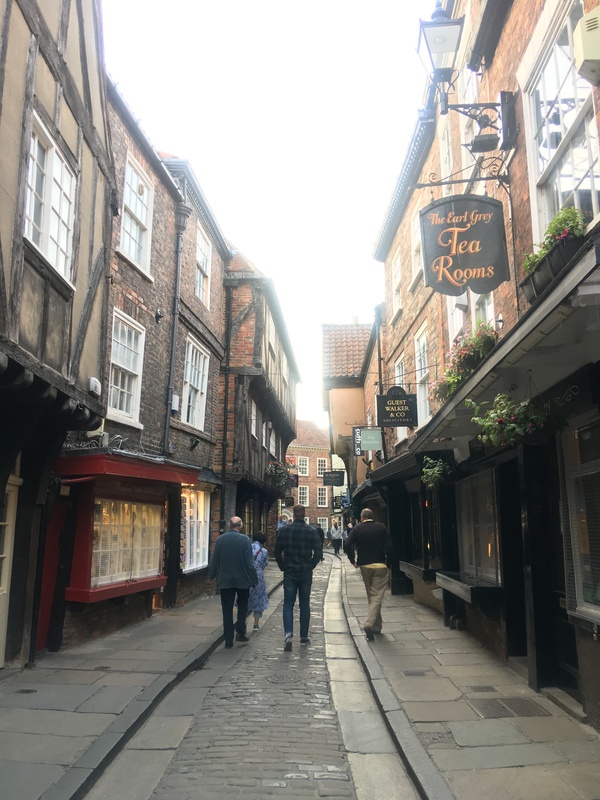 It was getting late and we were hungry so we walked down to a street called The Shambles, which is the oldest intact street in the country. It is narrow, the buildings are small and I can see it being used for movie scenes. We ate at an Italian place and I have to tell you that Papa Razzi and Maggiano’s are both very much better…and this place wasn’t all that bad. We’re just spoiled. 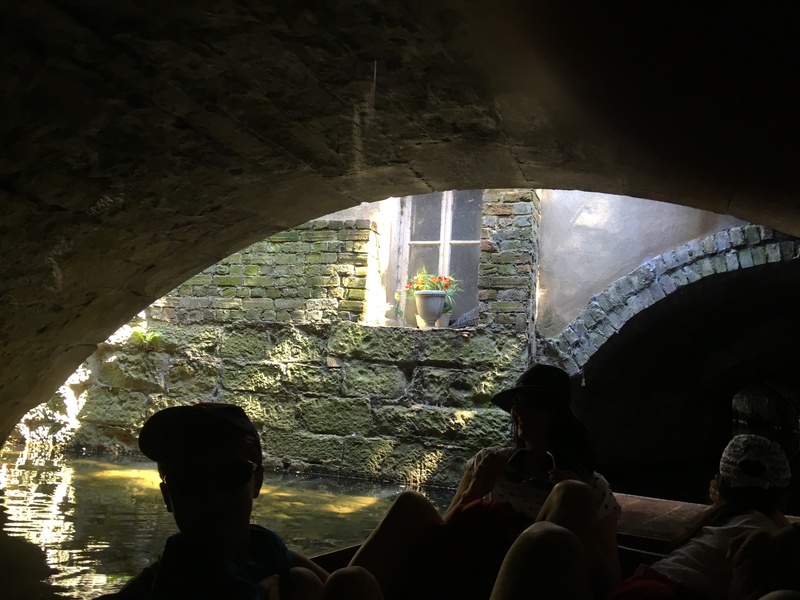 Then we drove back to our room to sleep so we will be rested for our long drive tomorrow to…. To begin some perspective, Stone Henge is five thousand years old and people proabably worshiped there or whatever they were doing for a long time before that. The oldest pyramids are also around five thousand years old and graves in the Valley of the Kings could be older….not going to check this. The Great Wall of China was built around fourteen fifty and the Great Wall of Groton finished in 2018. So, as things go Hadrian’s Wall is in the middle of all the grandiose building projects. However, the wall was built to delineate the uppermost limit of the Roman expansion into the British Isles and they never did get to Ireland. It is easy to check the history of the wall and Roman lands but the thing that interests me is how they came, they conquered and they went back home. We were in the Roman villa in the Cotswolds which was a very inviting, clement place. Not so at the wall. We were there on the Solstice and the wind was whipping around and chillingly cold. It can’t have been a welcome post to men from warm, dry Italy. The Scots….the various tribes that would some day become the Scots, were always trying to take back their land and overthrow the invaders….I can’t imagine why…and the wall was built to keep them confined. And it was very effective for several hundred years. 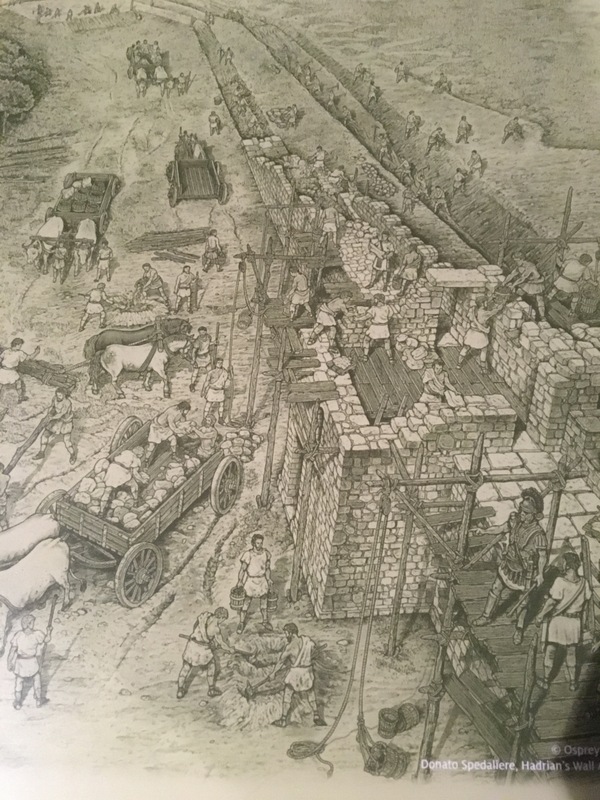 It took only six years to build and in addition to the wall every mile along it was a small tower with living quarters that was manned and there were larger fortresses along…several of them, also manned, and that wall was patrolled every moment of every day. Their cisterns were morticed with lead and some of that is still intact. 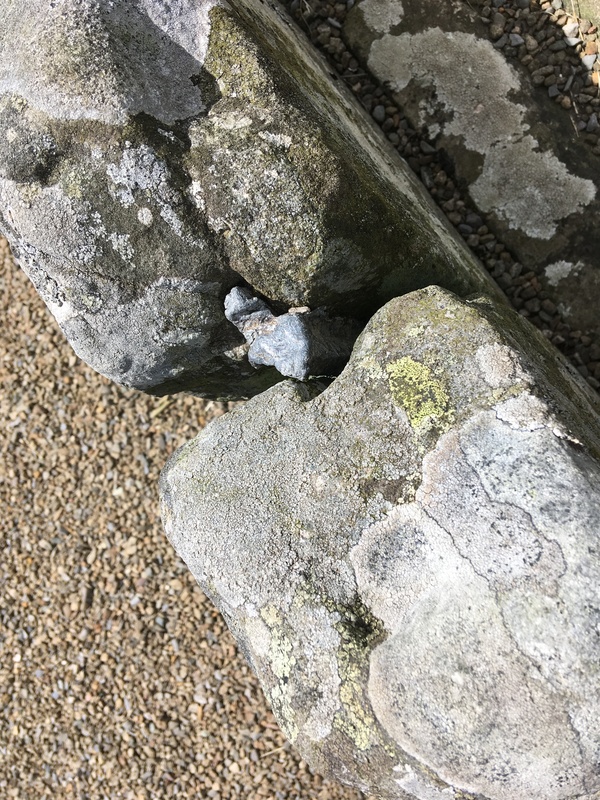 You can see it, gray, between the big stones. They had to haul everything up that very steep hill to the garrison including water but they had locals working for them. It would have been a hard life for those workers. Now there are sheep there….hundreds of them as there are everywhere in the north. 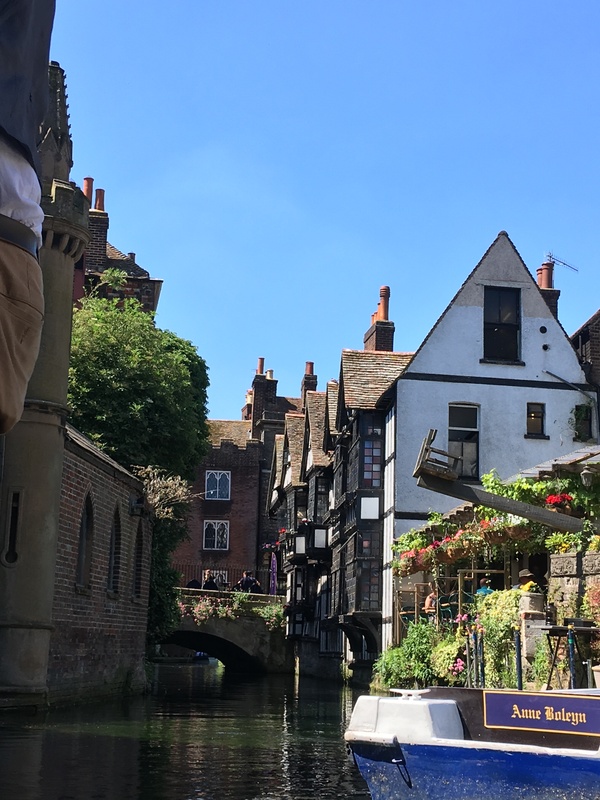 England is very narrow there and the wall is only seventy three miles long but it spanned the country…much like the Ice Wall in Game of Thrones. The foundations of the Roman military garrison and the small village that grew up outside its walls are still there, snug up against the wall. 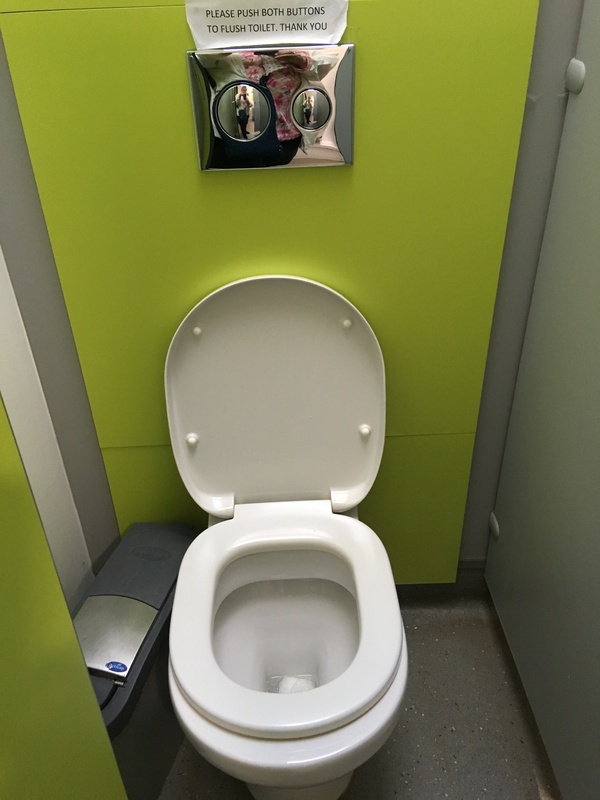 We had a tour guide who explained the purpose of the rooms that would have been there and most especially their water, latrine and sewage systems. 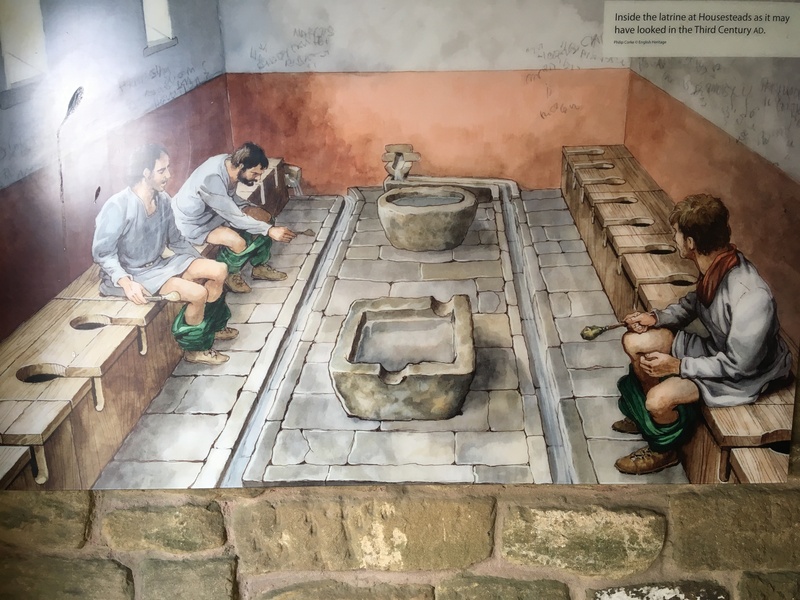 For the next two thousand years or less, people would empty their slops into the street or a cesspit if they were lucky but the romans up there on that windy hill had the equivalent of flush toilets. In some ways it is sad that Rome could not keep it together and due to internal fighting had to leave Britannia. In many ways they really did bring peace and prosperity to Britain. They allowed people, men, to become Roman citizens after twenty five years of military service and all their decendants were then citizens. Citizenship brought many benefits not the least of which was a pension. The reason more of the buildings are not standing is that in the next fifteen hundred years the locals took them to build houses, churches, etc., because they were already quarried and shaped saving thousands of hours of labor. 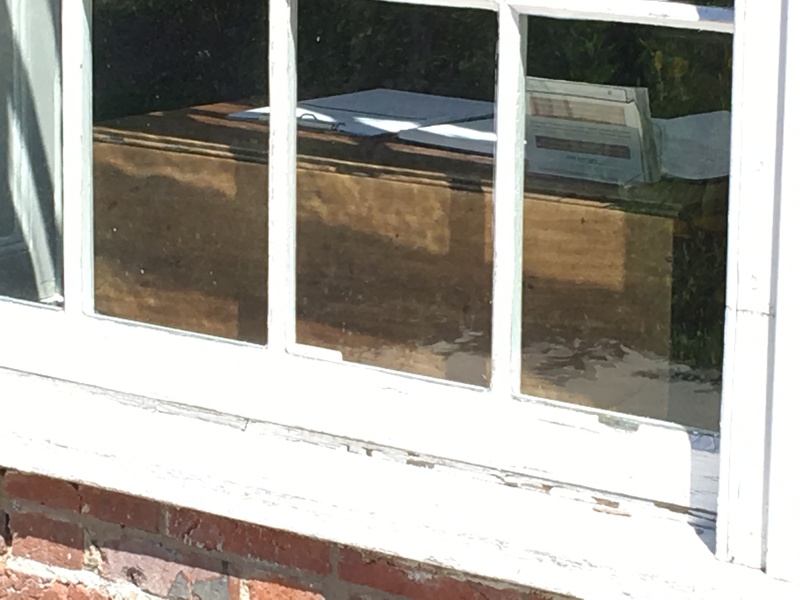 One stone which was inscribed with a commanders name was taken out of a hearth in a private home and donated back to the museum. We visited the military museum and they had a half hour film taken above the wall along its entire length. As the camera went along they superimposed views of what it would have looked like in AD 150. 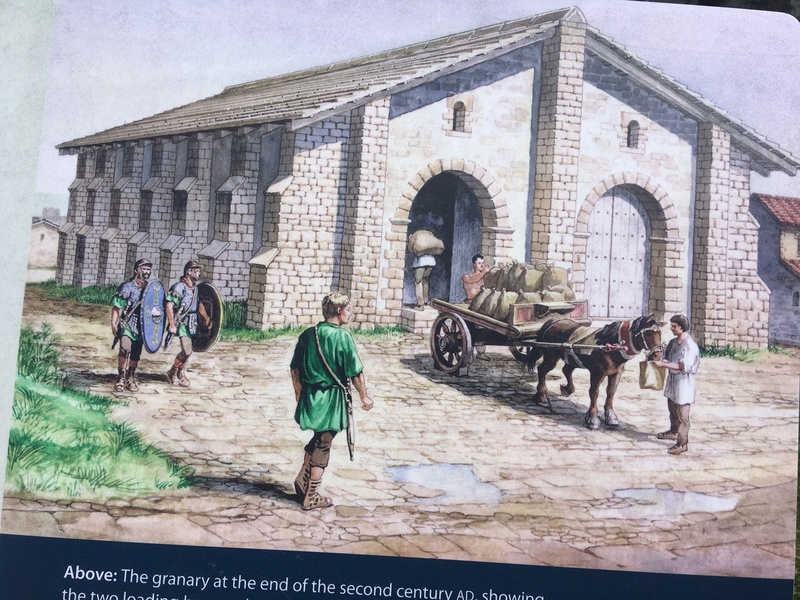 They know what the buildings looked like because they have many examples of Roman architecture. The Roman Empire did not build by half measures. The wall is truly impressive, high and thick and couldn’t have been easily scaled. It is a thing here in Britain to walk all over the country and walking the wall is very popular. I was surprised at how many people were there with us. 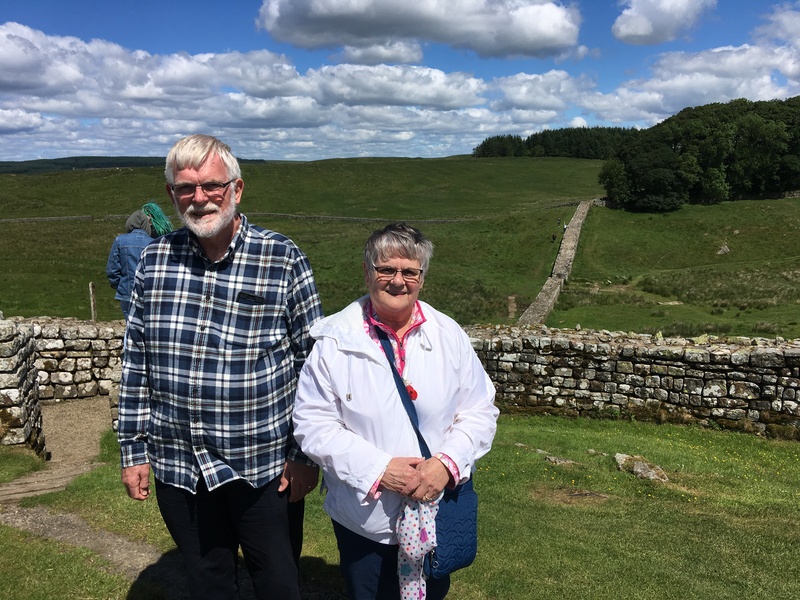 I know folks back home wondered why we would go all the way to England to visit Hadrian’s Wall…after all, it is just another stone wall. A funny thing, as we crested the hill and could look down upon the wall snaking its way across the country side I said, “Is that it then?” Everyone laughed…they probably thought I was unimpressed but it fact England has a surfeit of stone walls and I was just making sure! Being at the wall was to me like being in one of the great cathedrals and I had the same shivery, otherworldly feeling. 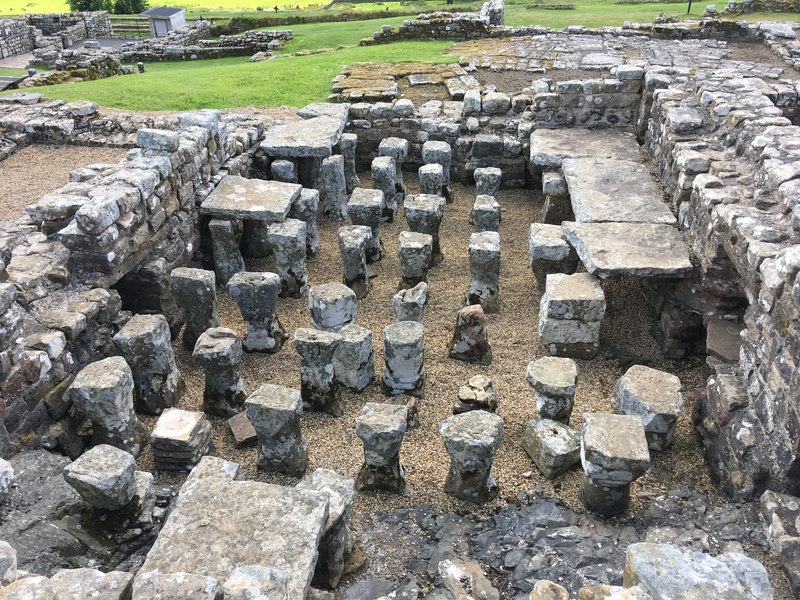 (The fallen columns are the temple) (The floor of the hypocaust warmed room was tiled with stone…not wood as I earlier surmised). 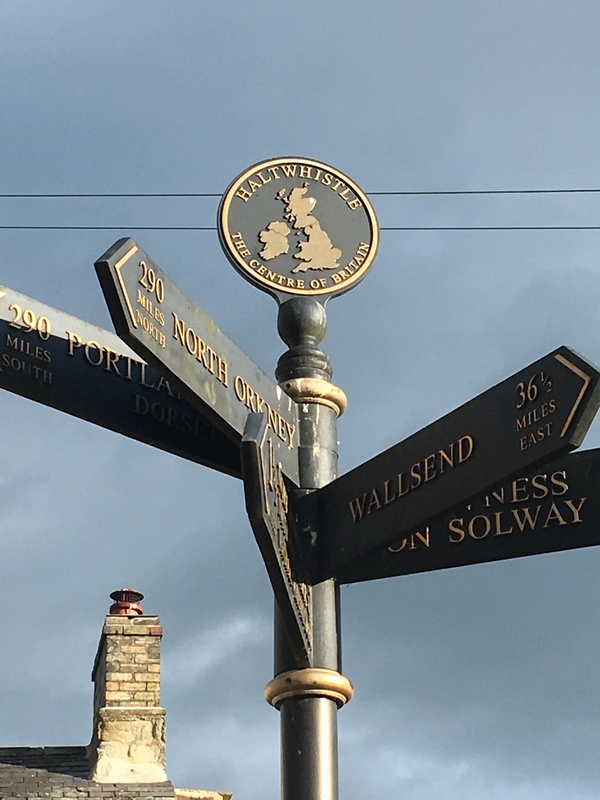 Haltwhistle, the town we stayed in, calls itself the ‘Center of Britain’. The town is situated half way between the coasts of the Irish Sea and the North Sea and half way up(or down) the country from north to south. Kids keep moving the sign and I can understand that…very tempting. We wandered into the local church which was built in the 1300s and lo, they were having choir practice. We were invited to come in and view the church and we stayed to listen to them and Eric couldn’t stand that the bases were sharp and he kept chiming in with the correct note (softly) but someone noticed and invited him to join them. I think the choir mistress was getting fed up with them not hitting the right note. That experience is not unusual, everyone in this country has been gracious and welcoming. 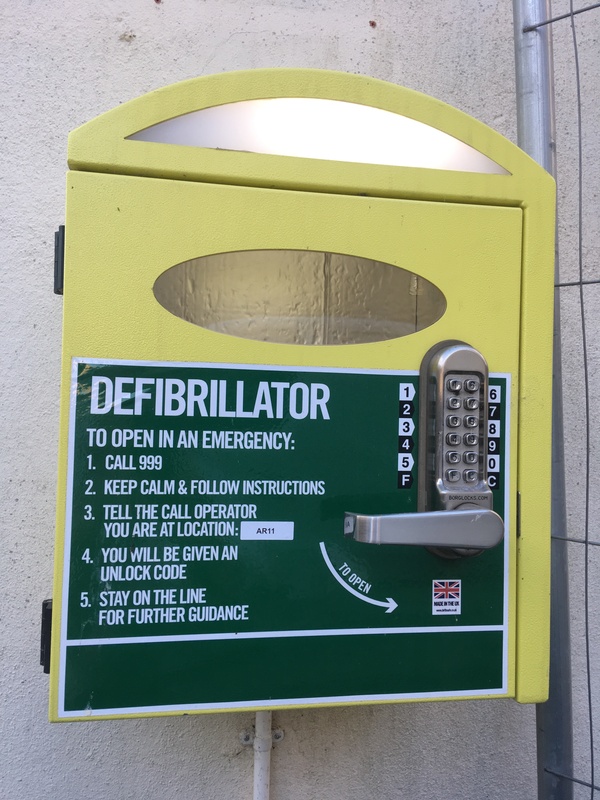 There are defibrillators everywhere in this country! They put them in the old red phone booths and stick them on walls sort of willy nilly and you have to call the police station for the unlocking code and then I guess just follow the instructions and wait for help to come. The thing is, you have to have your heart attack next to one of them and hope you are not alone. And last…here are two not very intrepid travelers on a windy hill with the past spread out around them. 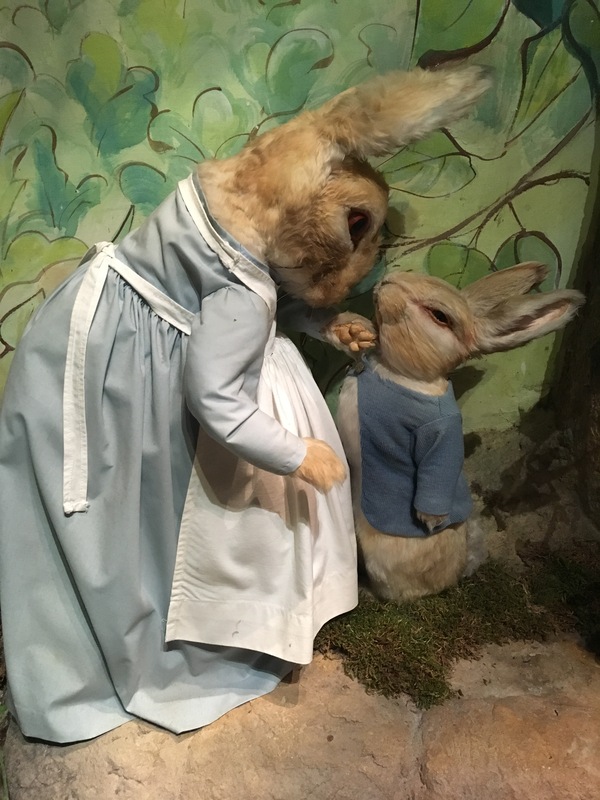 Beatrix Potter wrote those charming books about the little animals and her cat, her rabbits and her duck with whom she lived. She also had a husband. And a brother who painted and who drank himself to death. She used her house and buildings in the town of Sawrey in some of he illustrations as well. I have always loved her stories, especially the story of Jemima Puddleduck because she was a gullible woman who went off with a smooth talking, nicely dressed, very elegant gentleman, like so many other women. And I have always liked Samuel Whiskers because he rolled Tom Kitten in dough and was going to cook and eat him. It is hard to find villains in Ms. Potter’s stories…I don’t include Farmer McGregor as I find him a kindred spirit, not a villain. But the thing I love most about Potter’s books and other works is her art work. 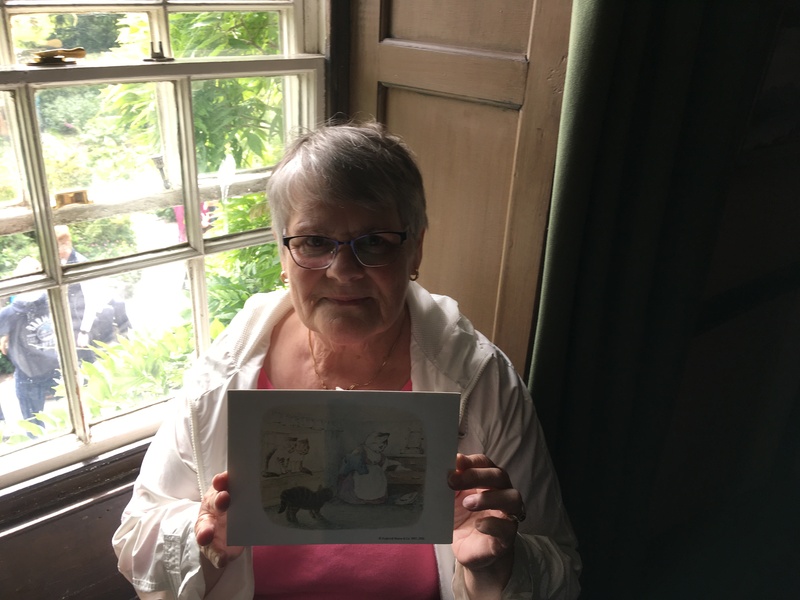 There is something gentle and real about her pictures and when we had the opportunity to visit her home, a National Trust property along with four thousand acres of other farms she donated, we jumped at it. 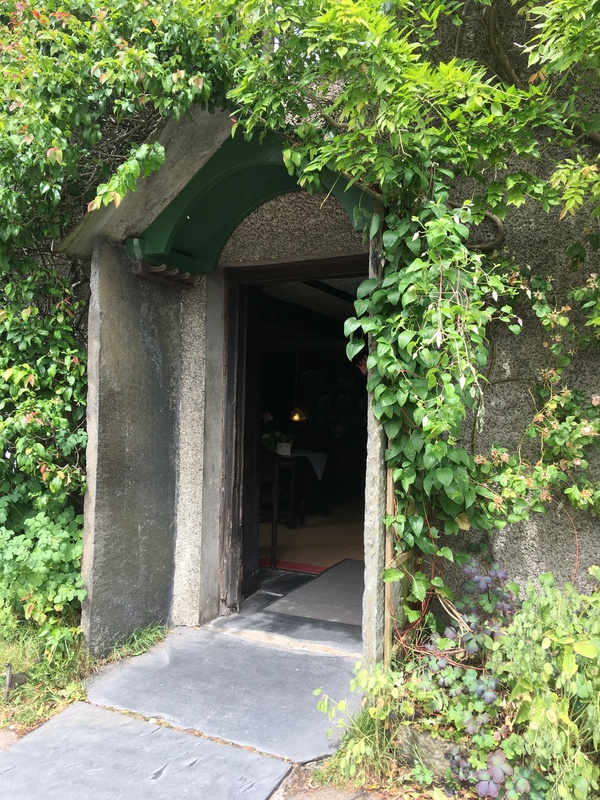 The door to her house is made of several huge, thick slabs of local slate. You can see this in the picture. 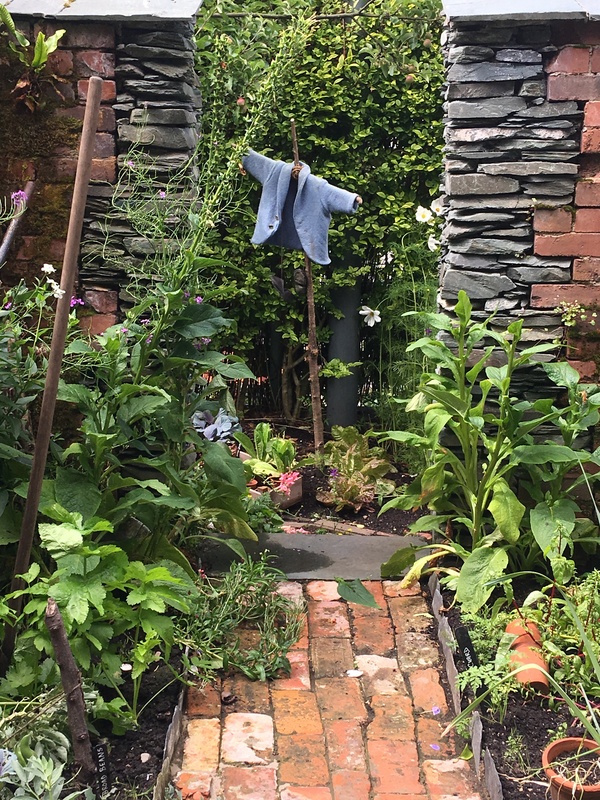 This looks out on what was once a vegetable patch and I can imagine her standing there regarding maurading birds and small creatures in her garden. 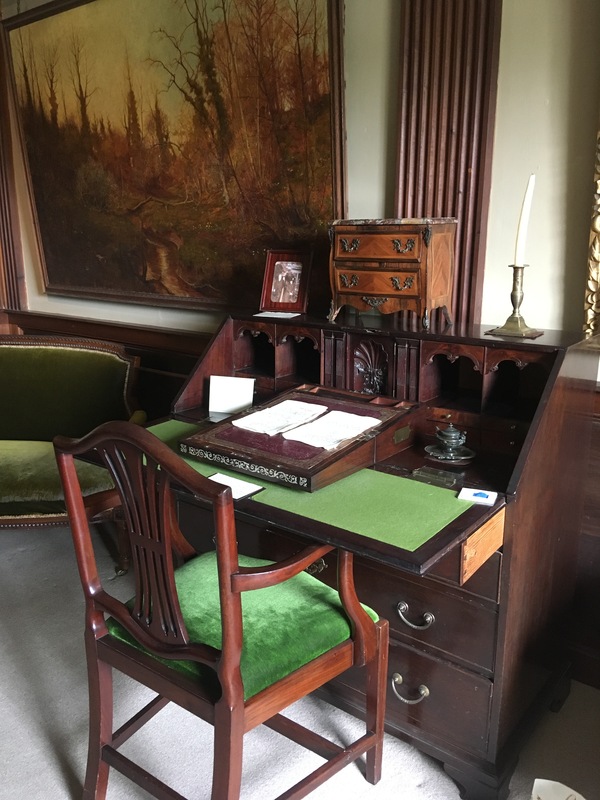 Inside the house we saw the desk where she likely wrote the stories, her furnishings, her intricate fireplace and much more that was charming and comfortable. 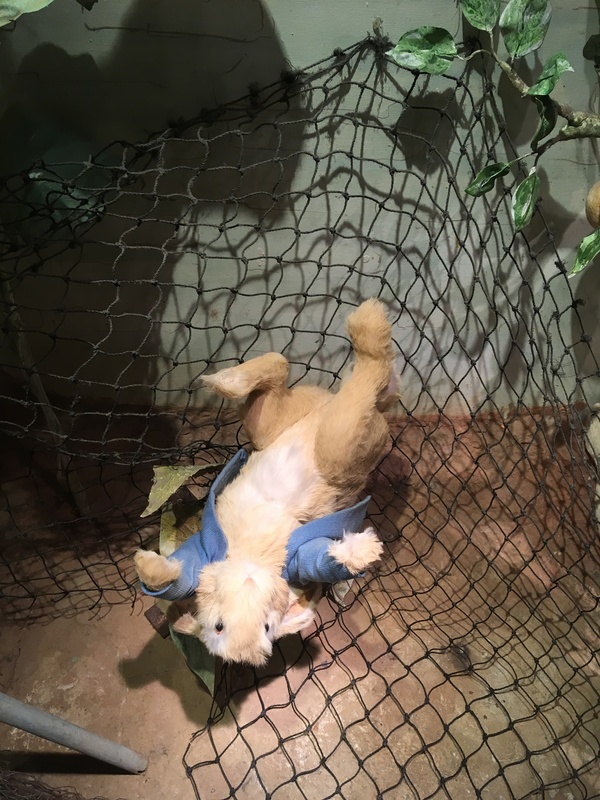 We also visited a ‘roadside attraction’ that was geared toward children but had enough charm for all. There were tiny mice in their houses, Peter Rabbit coming to grief and many other characters. One can get the flavor of the scenes represented by these photos of Peter’s downfall. Also, I am sitting on the window seat with a picture from one of the books of that exact place. And those two old women? 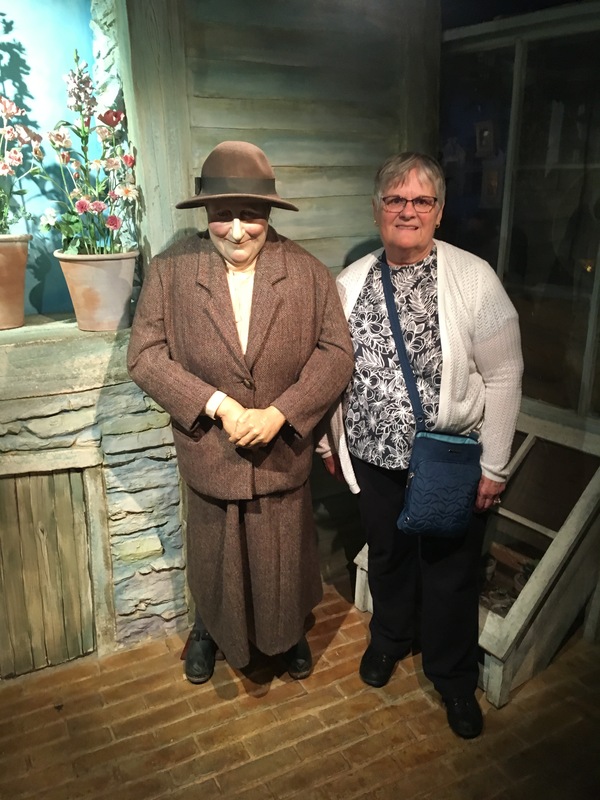 One of them is me and the other is a wax version of Beatrix. 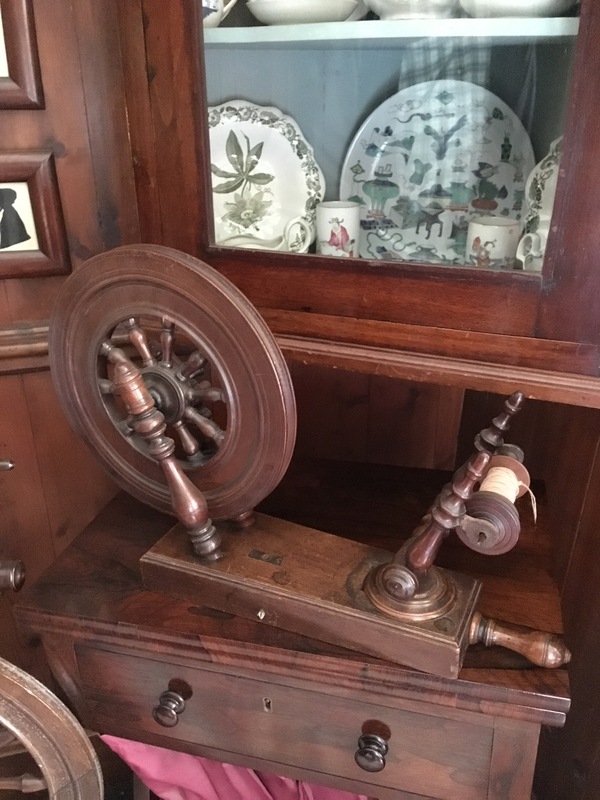 The little spinning wheel is sitting on top of a regular one and it is a spun by hand, an early version of the electric spinning wheel which sits on a table. It was a wonderful visit and I’m glad I have the photographs to remind me. We also visited Wray Castle that day which was notable only for the beautiful views and was otherwise just a castle. And tomorrow we are on our way to….